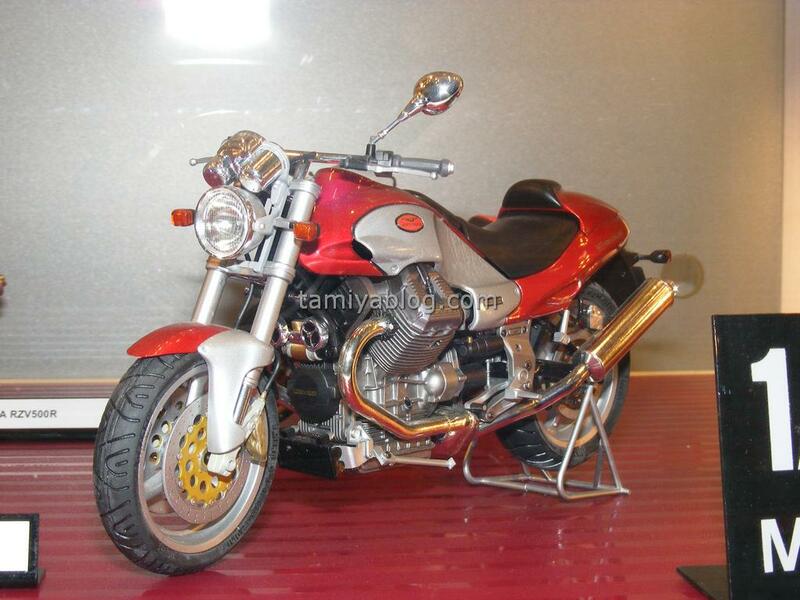 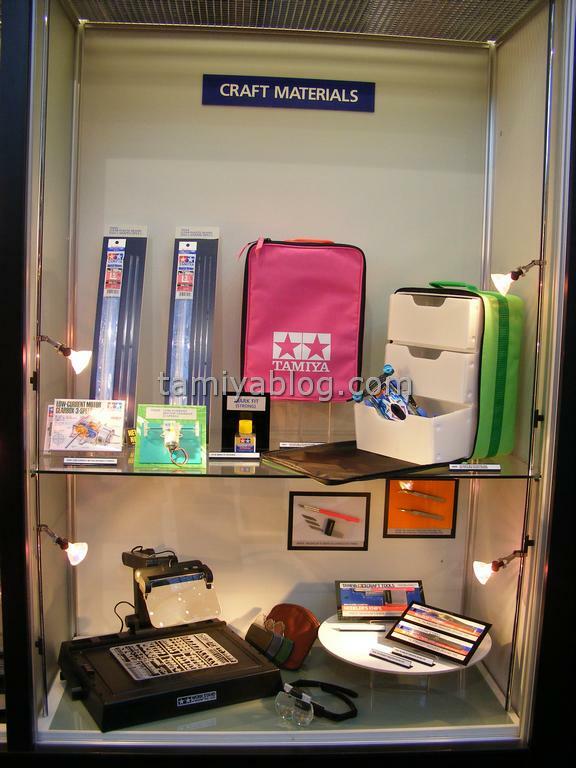 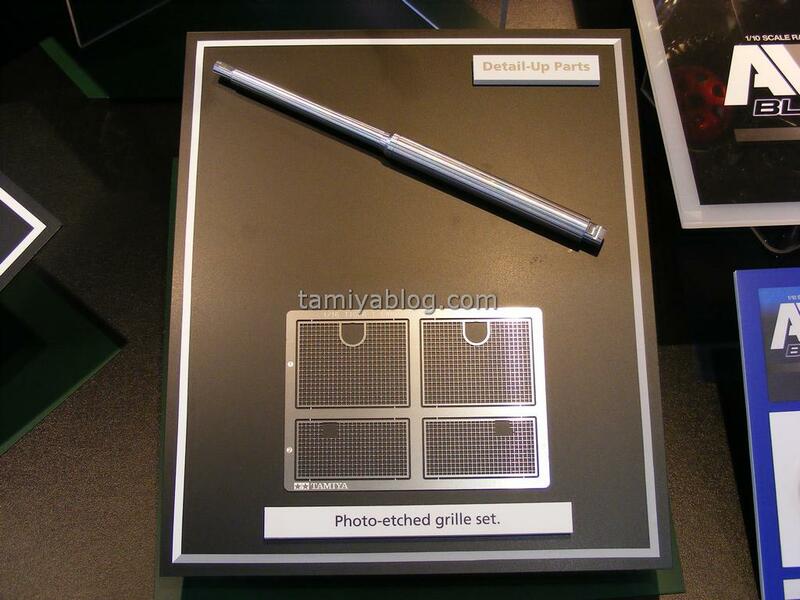 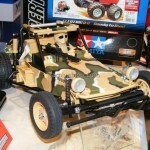 This entry was posted in Event Report, Media, Vintage on February 24, 2012 by admin. 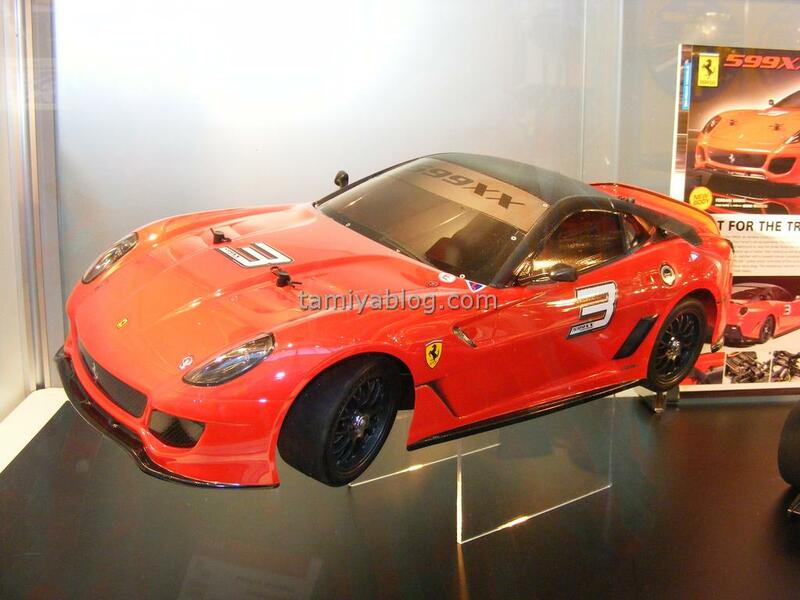 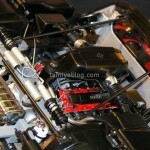 This entry was posted in Event Report, Media on February 20, 2012 by admin. 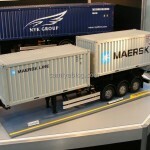 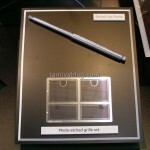 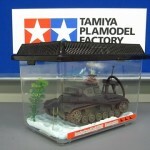 This entry was posted in Event Report, Media on February 17, 2012 by admin. 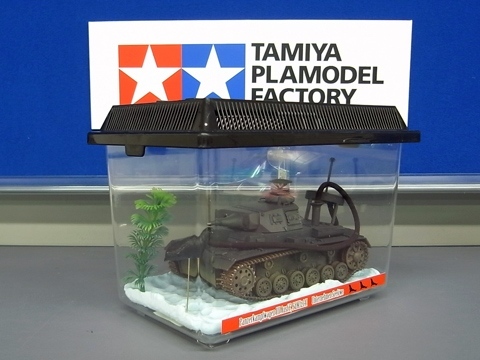 Kit No. 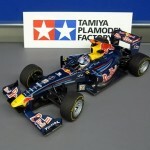 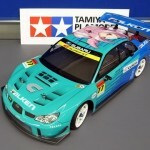 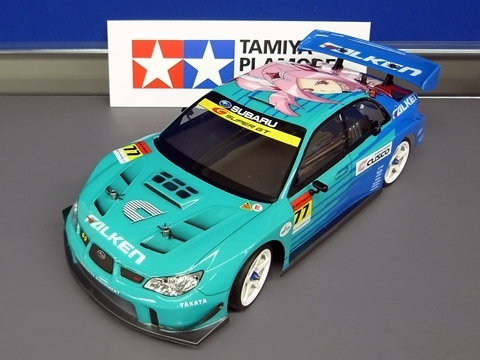 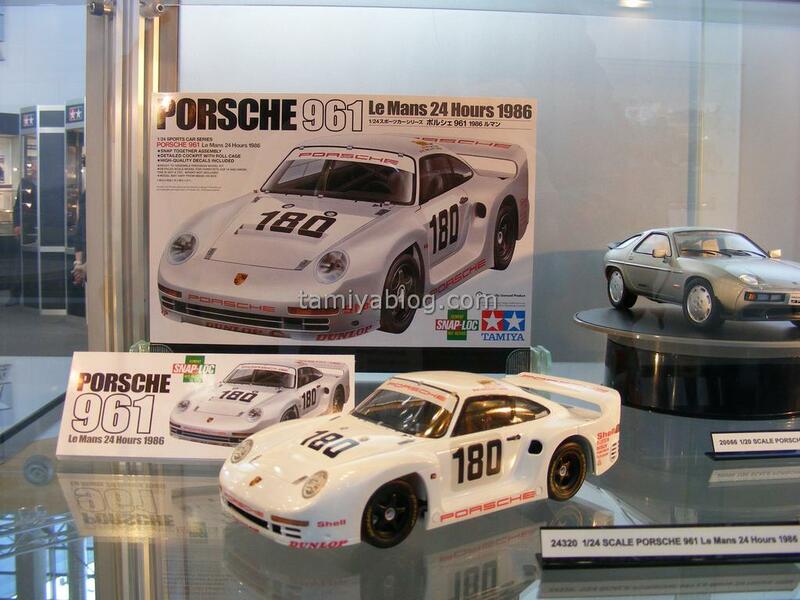 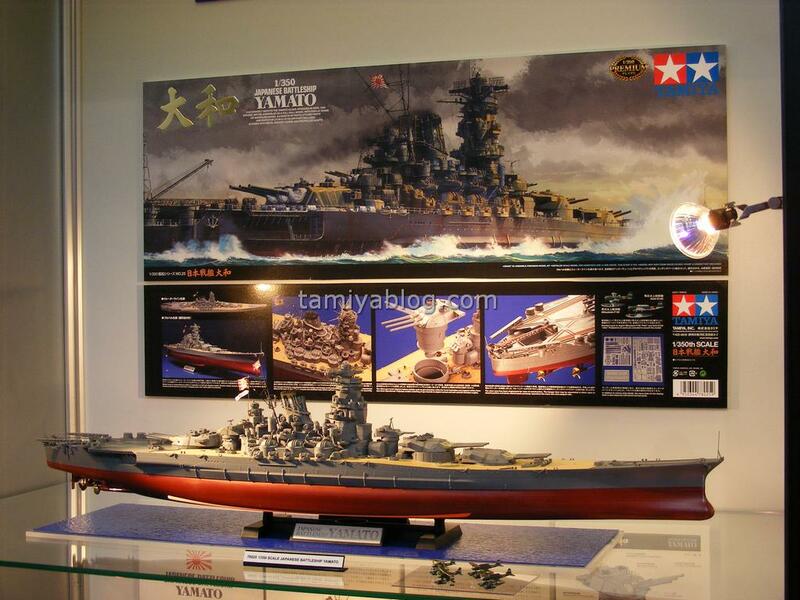 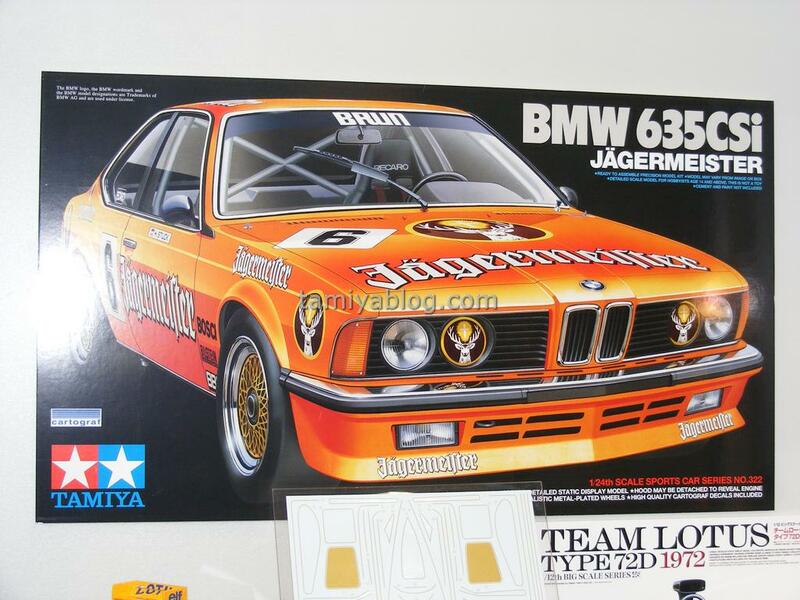 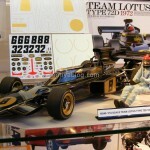 58527, Japanese release date late March and list price 13800 Yen. 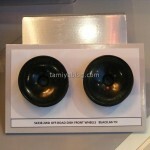 Color ring decorated with black polka dots on a white base can be finished easily with a large sticker. 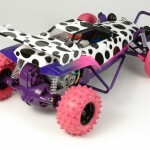 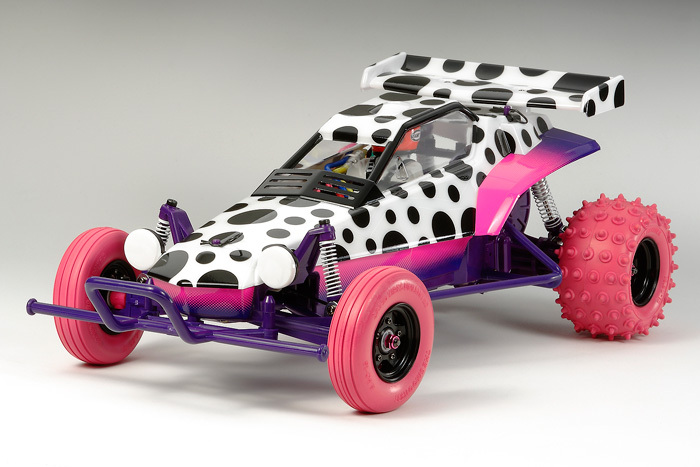 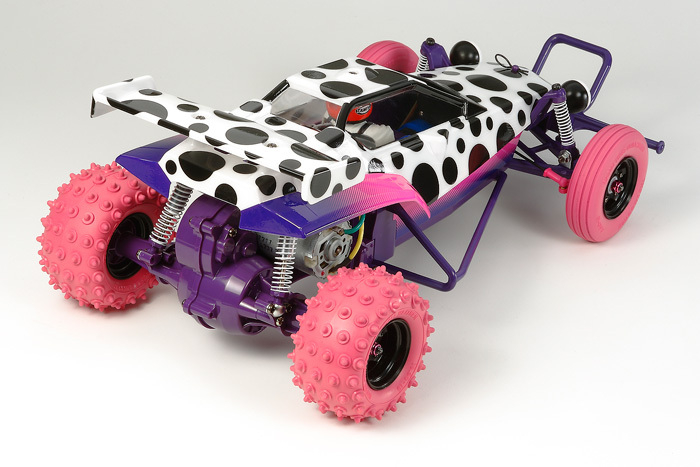 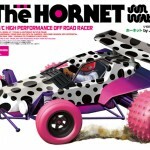 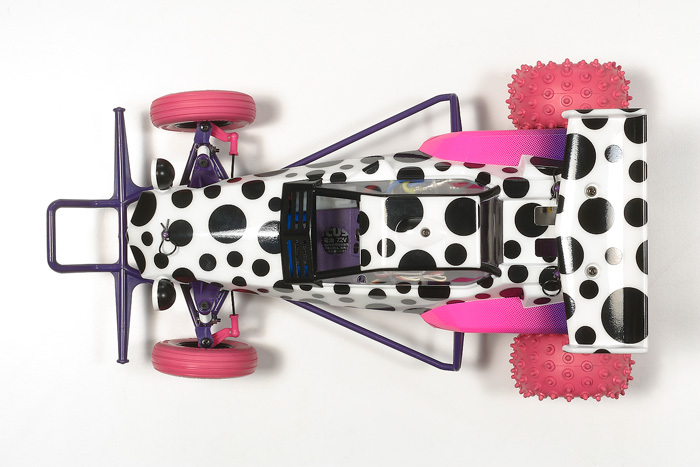 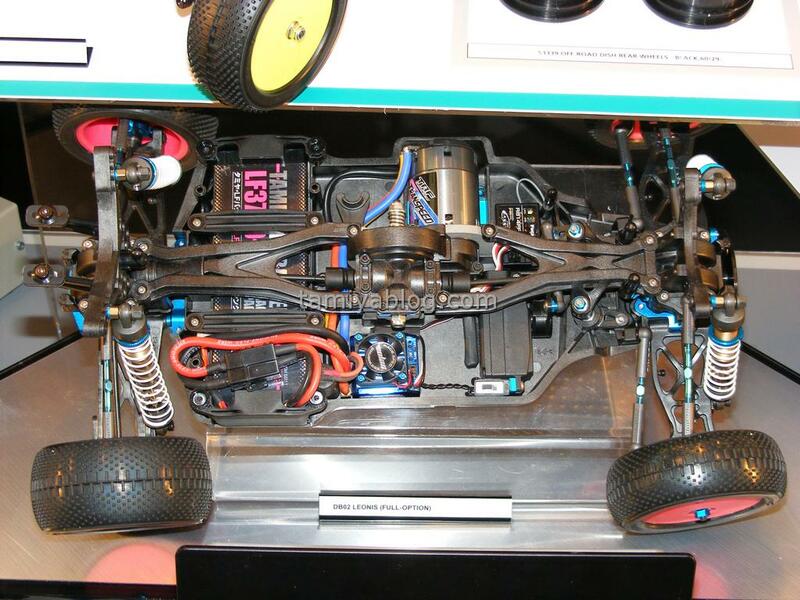 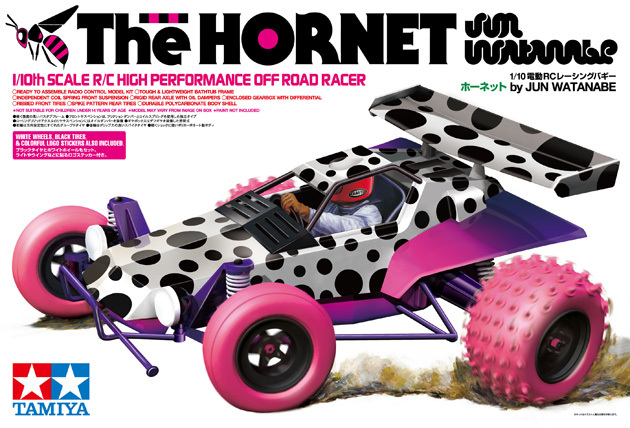 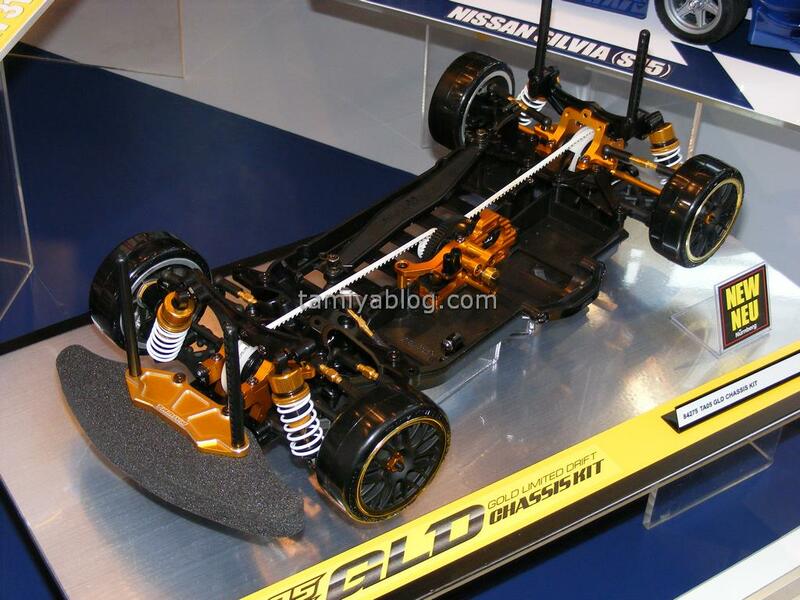 The chassis employs a color molding of purple, pink design that combines black wheels and tires is characteristic. 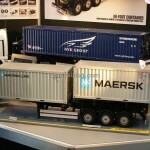 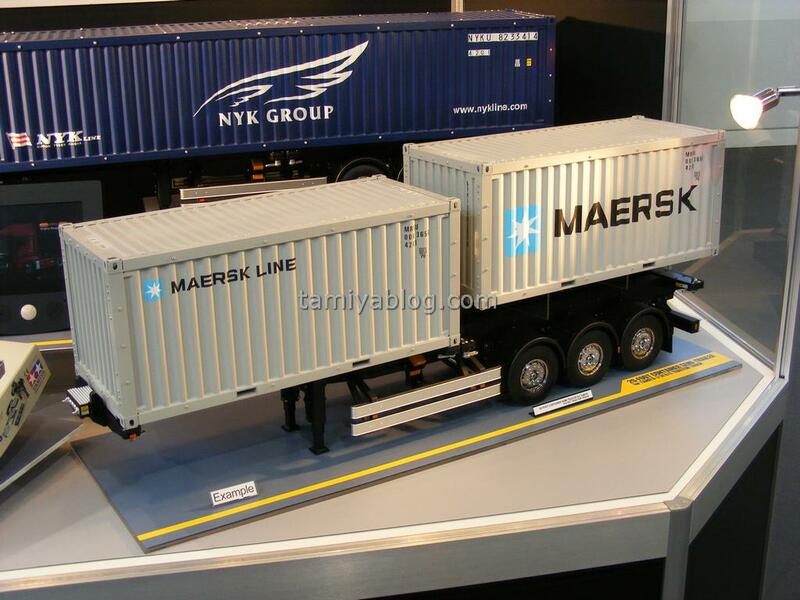 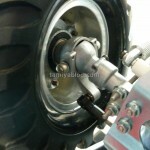 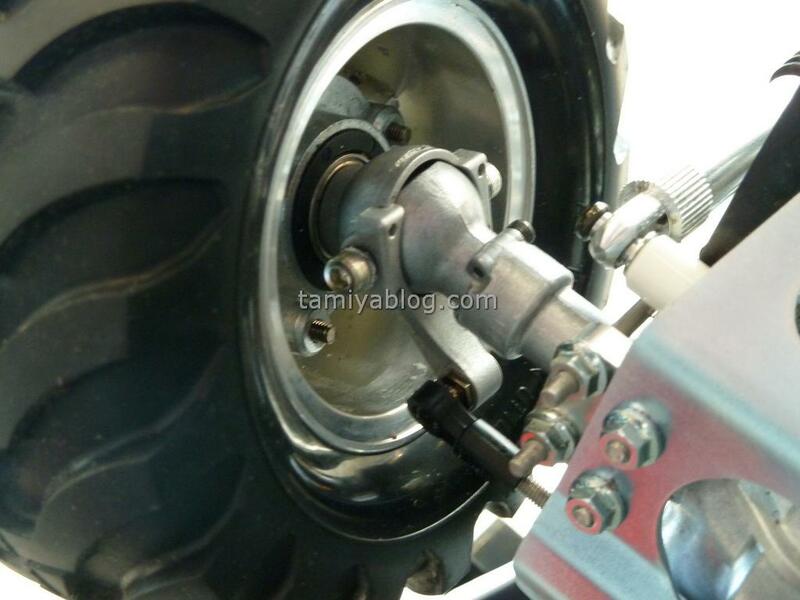 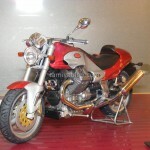 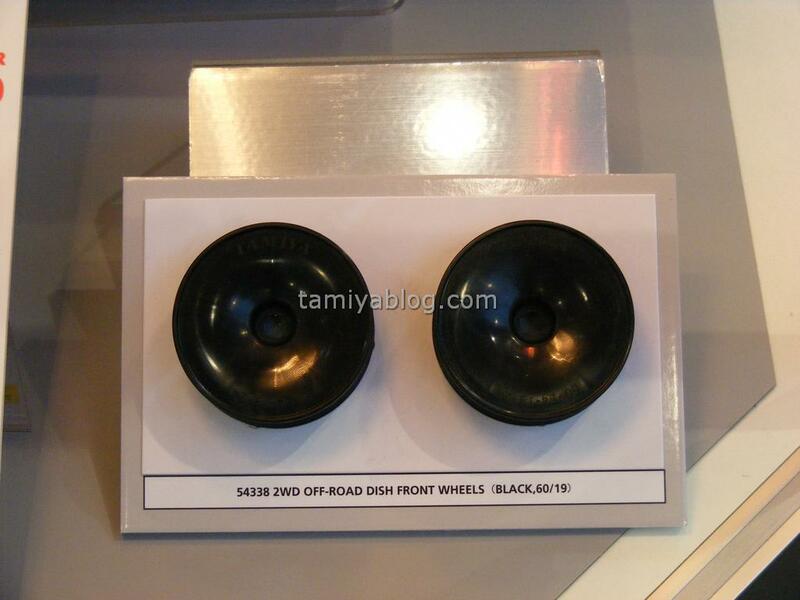 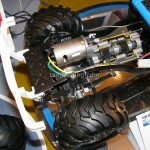 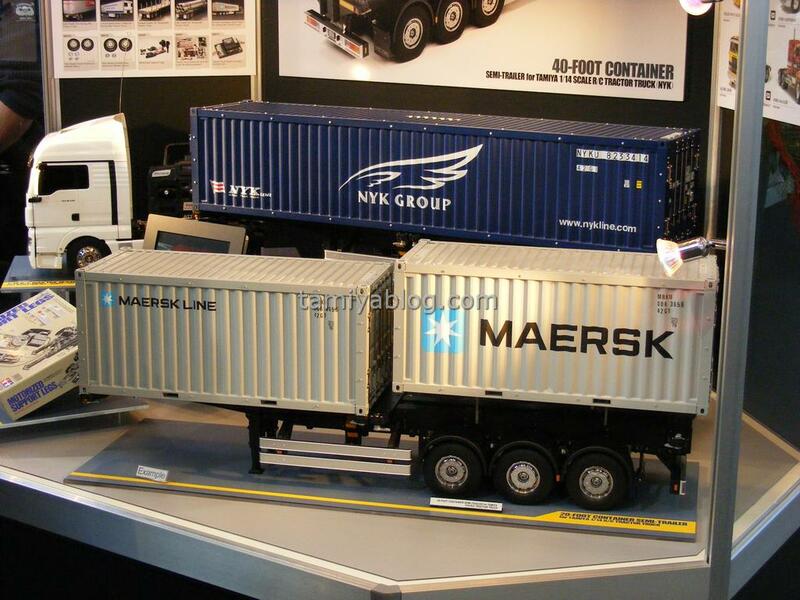 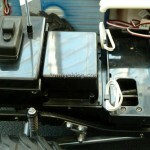 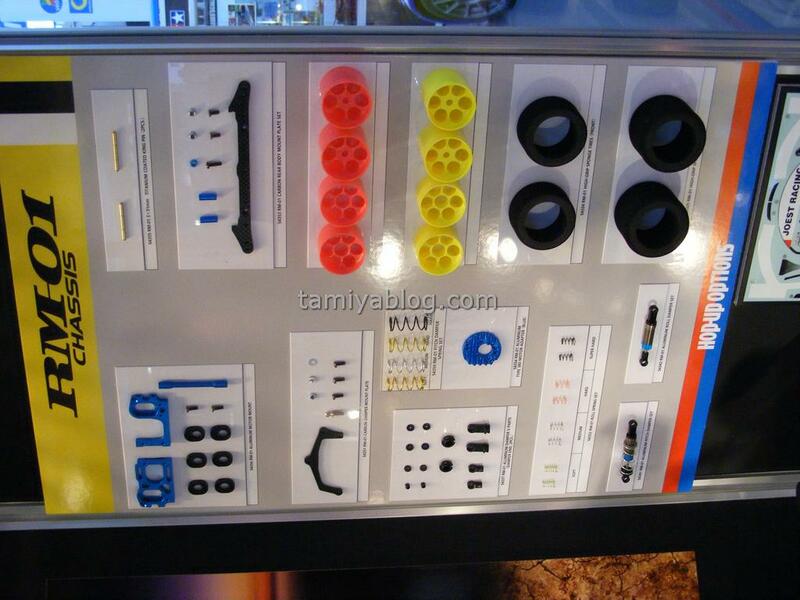 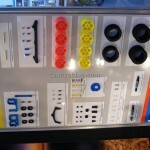 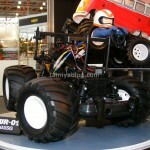 Moreover, it is also set black white wheels and tires for traveling. 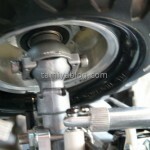 The item that was stuck to the wheel nuts and upright design, adjusters, etc., to detail which is integrated in the spring of white or pink. 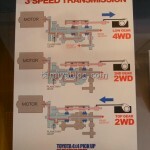 Adopt a high-impact design of the original image while also followed the package, emphasized the design. 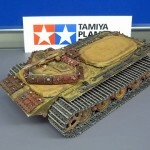 This entry was posted in Customized Builds on February 15, 2012 by admin. 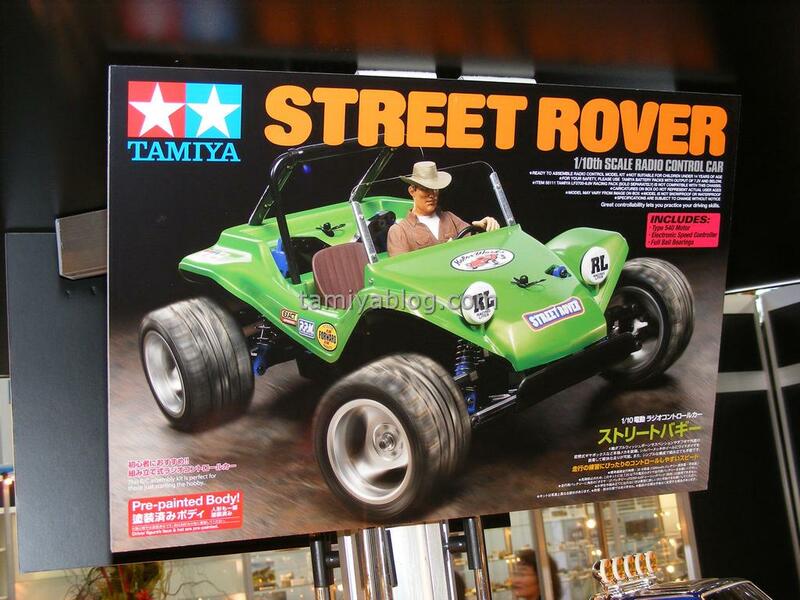 As always, astonishing Japanese creativity and quality of execution. 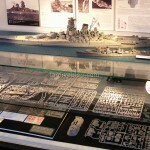 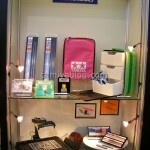 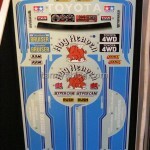 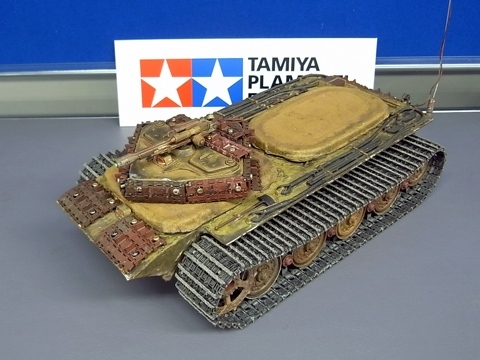 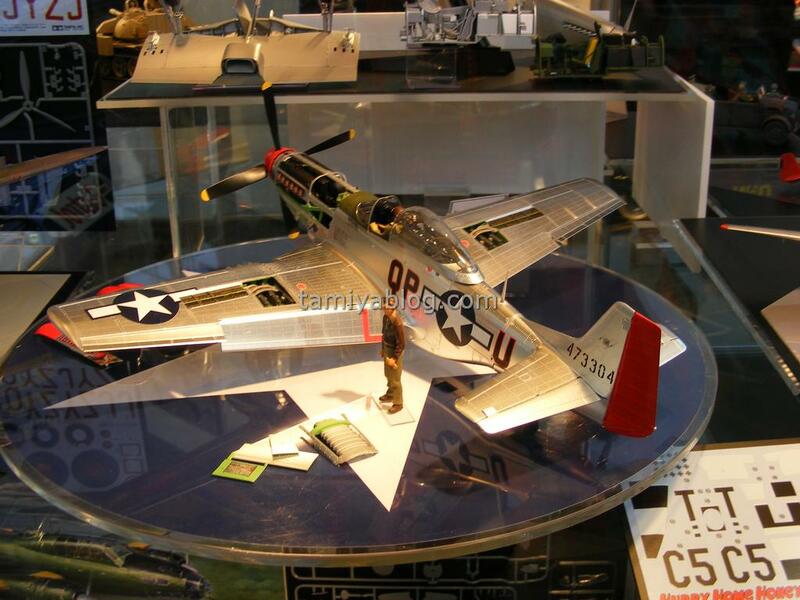 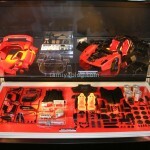 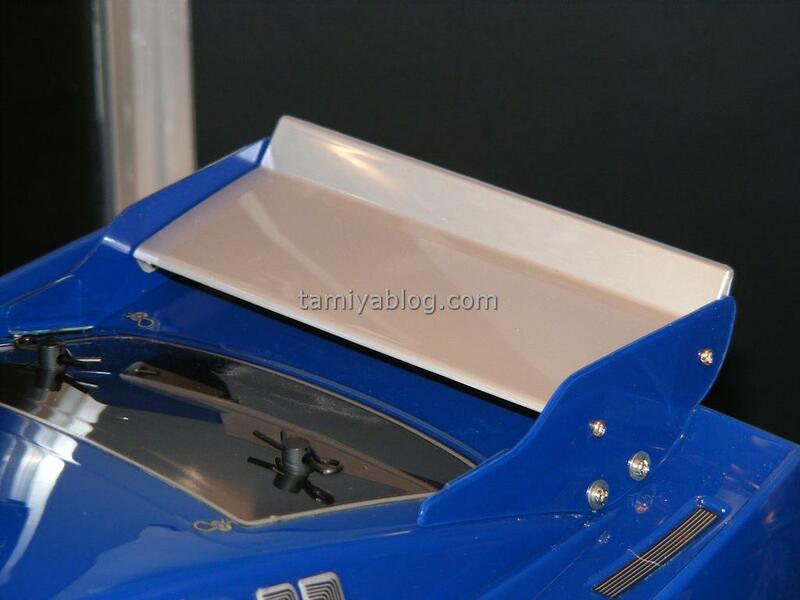 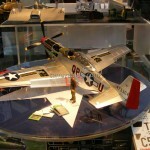 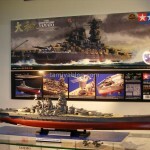 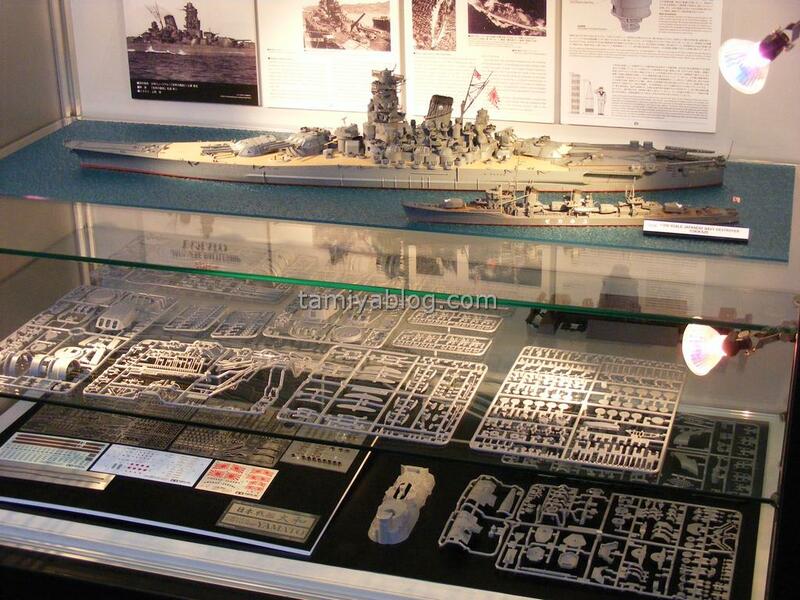 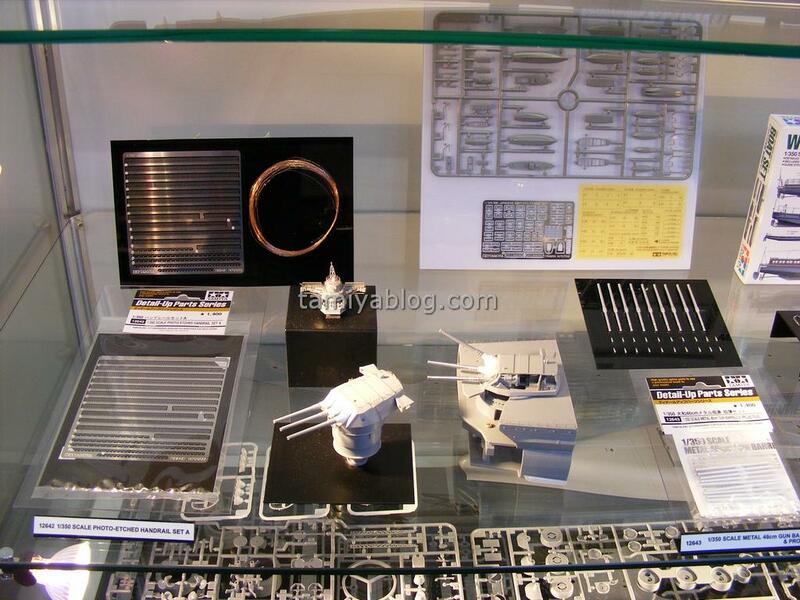 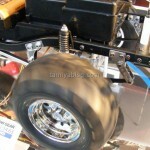 This entry was posted in Customized Builds, Event Report on February 10, 2012 by admin. 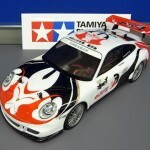 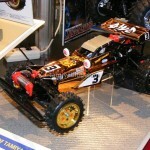 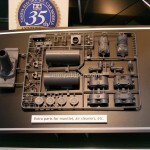 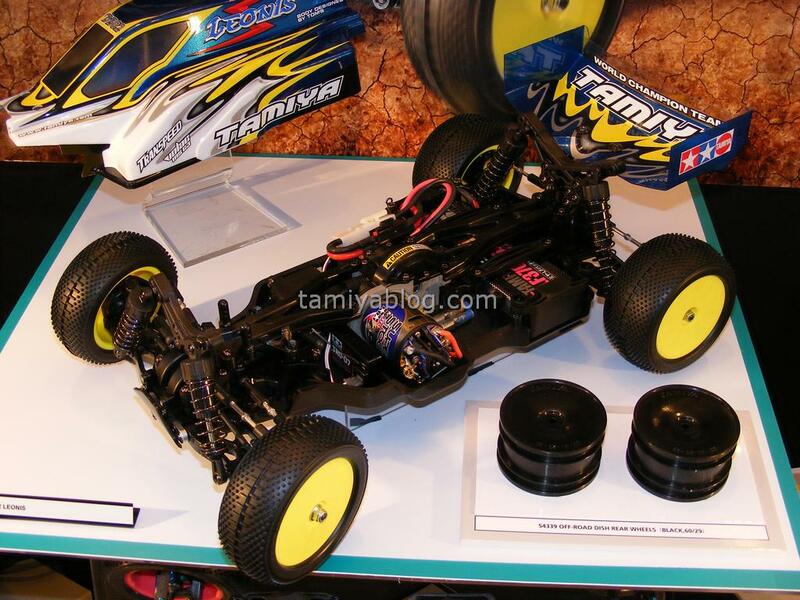 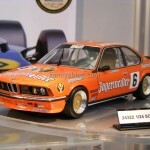 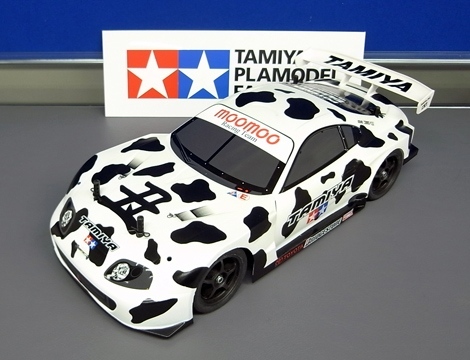 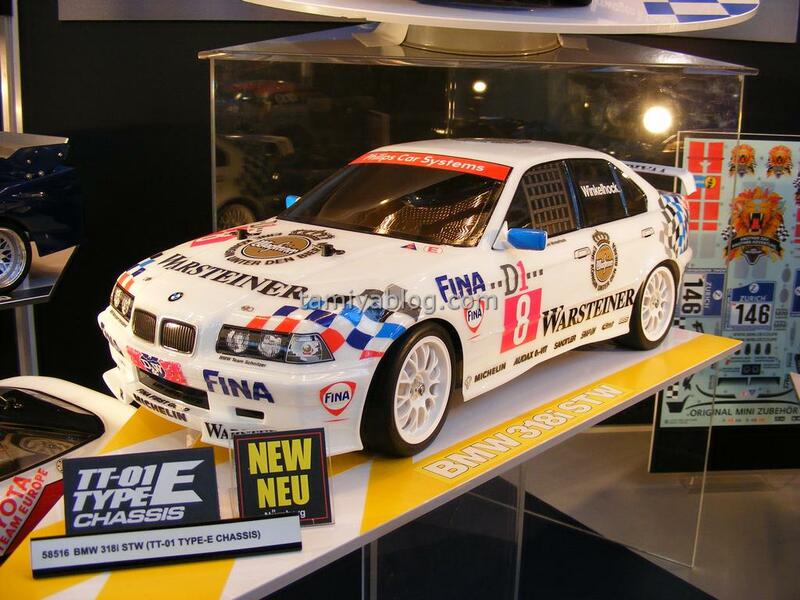 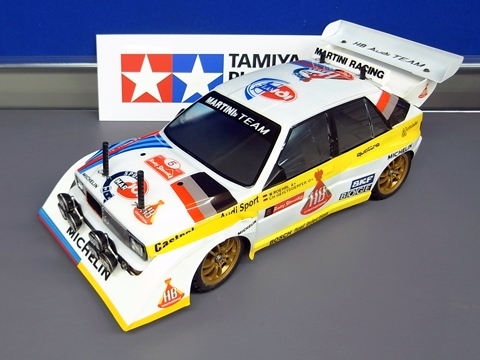 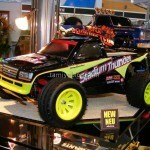 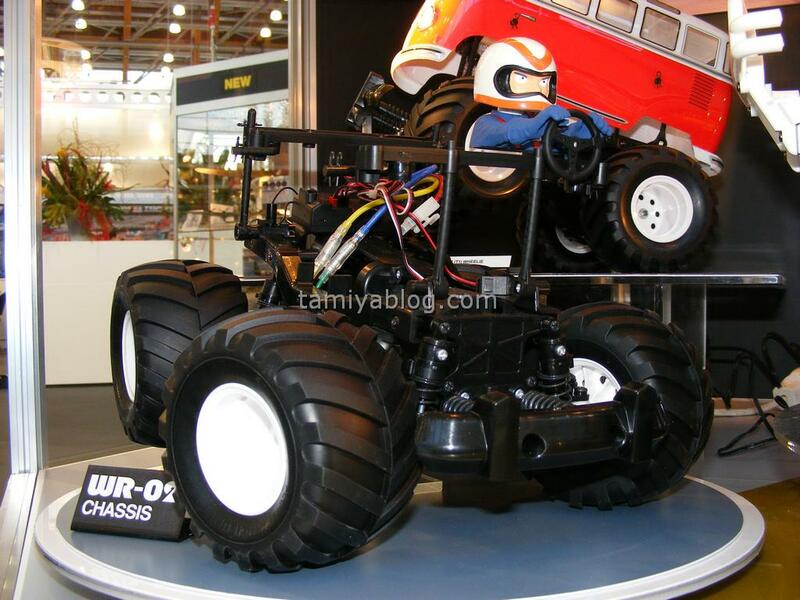 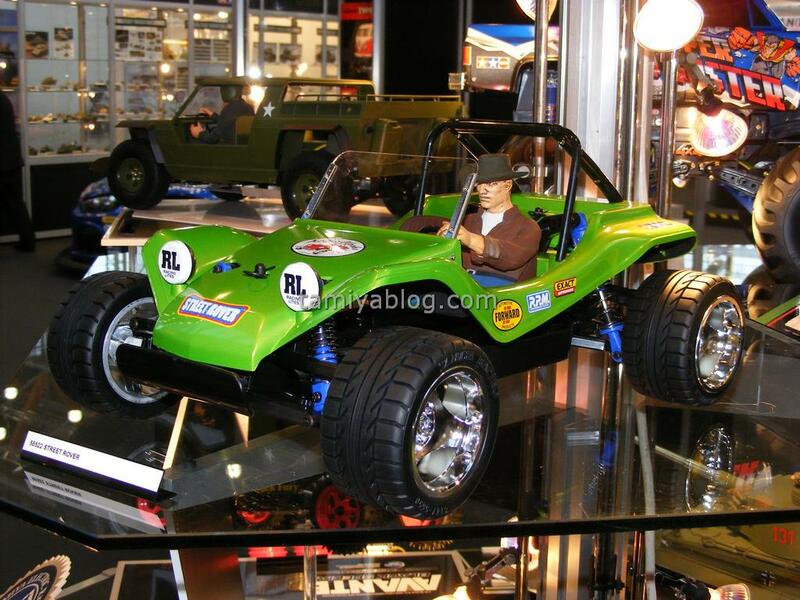 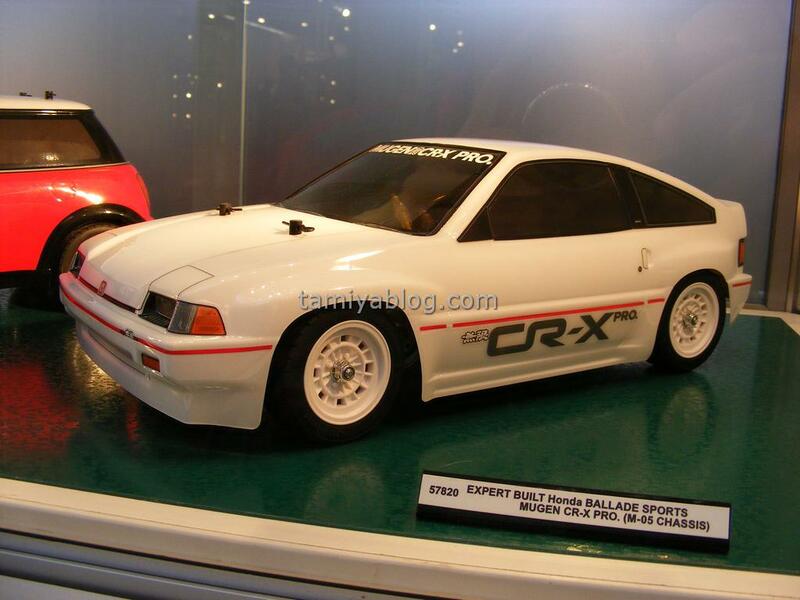 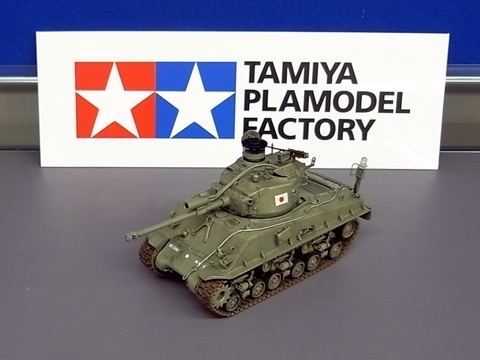 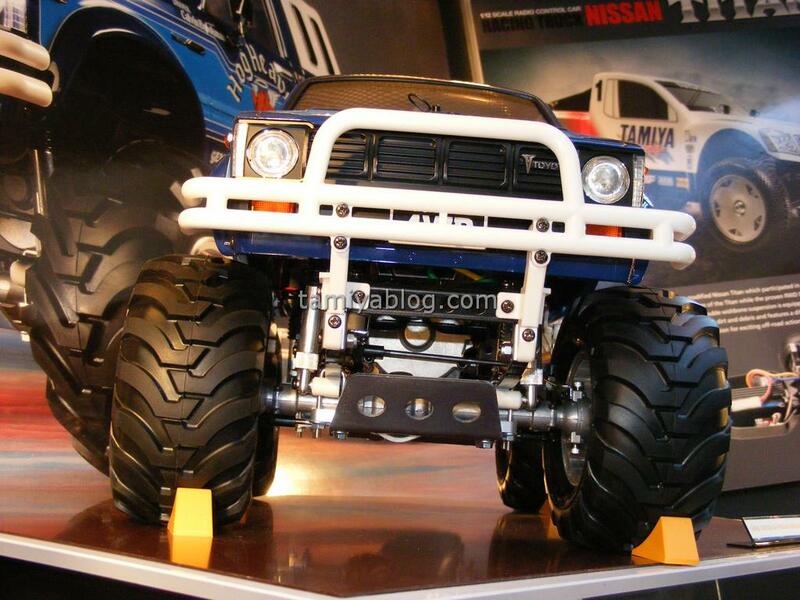 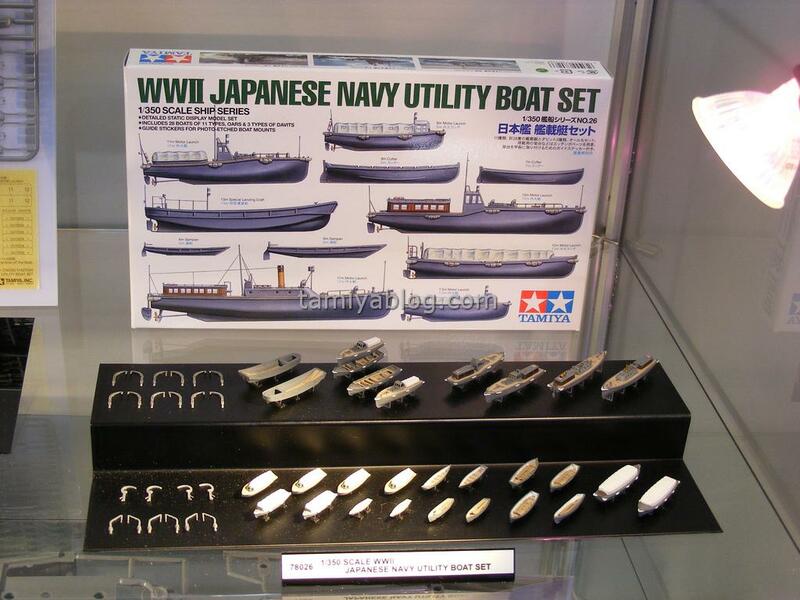 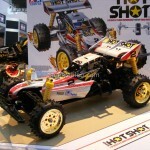 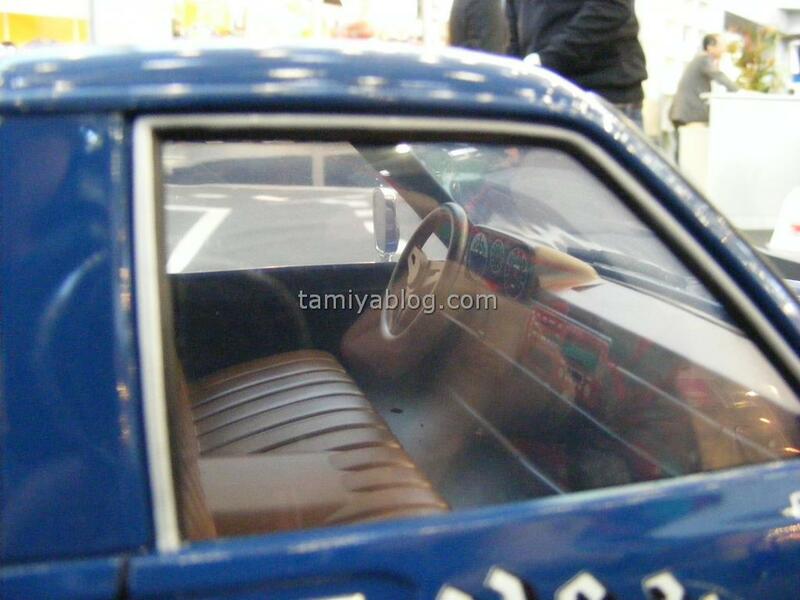 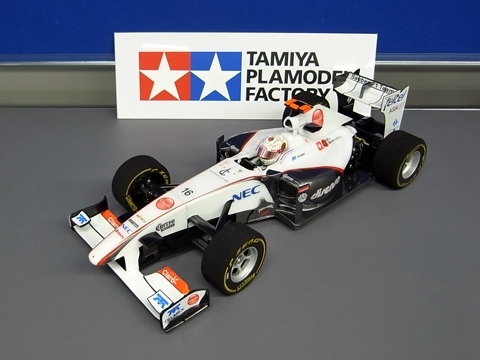 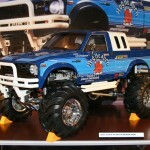 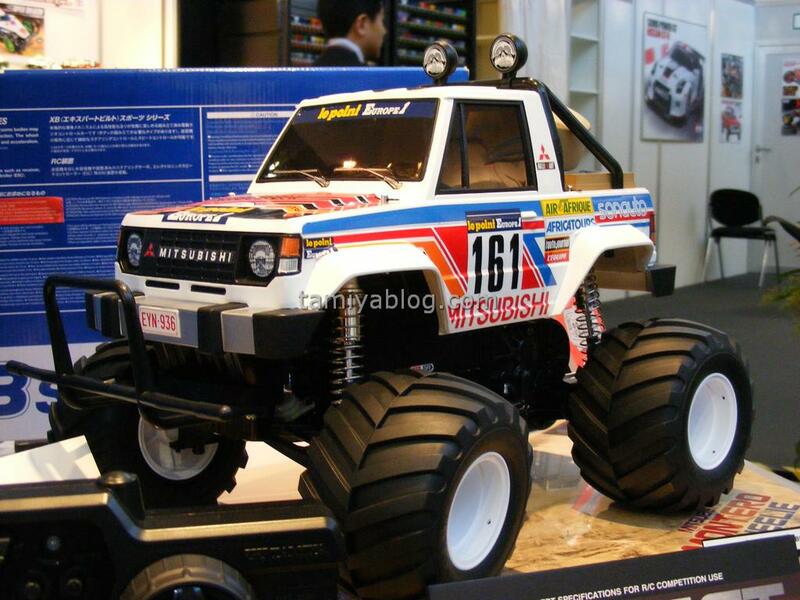 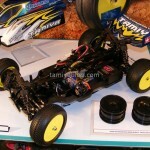 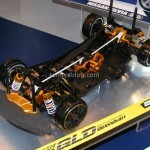 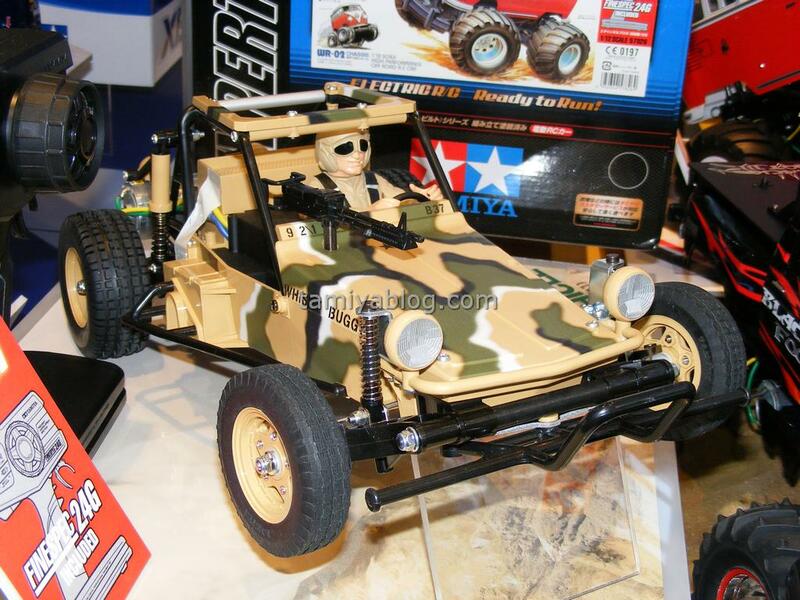 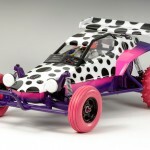 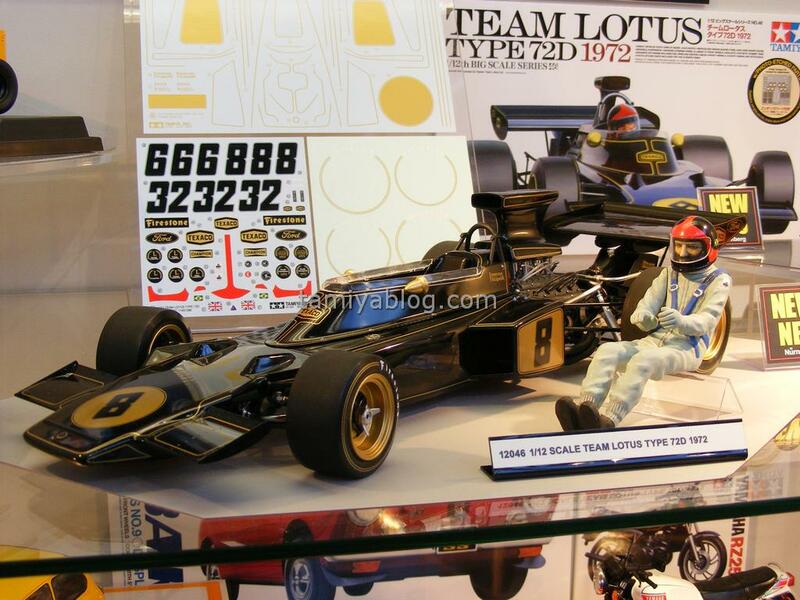 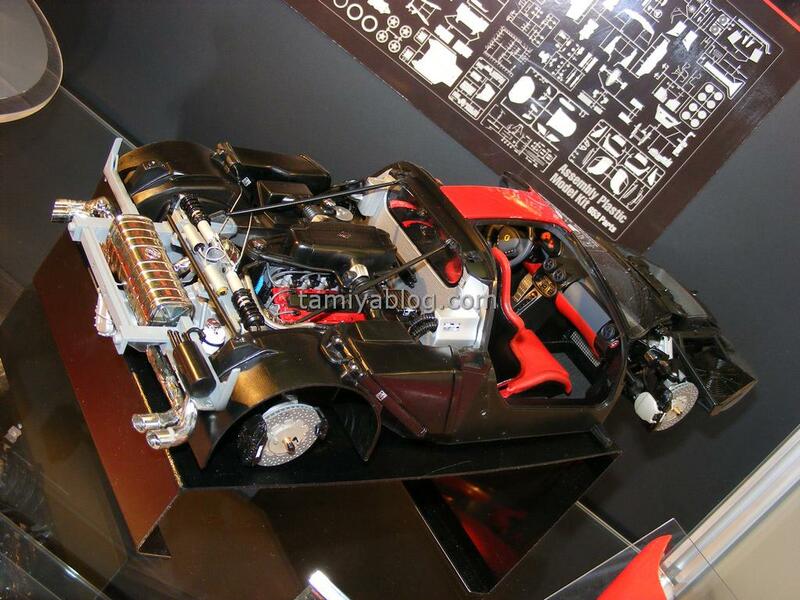 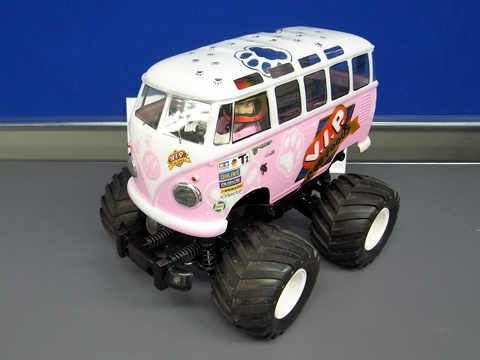 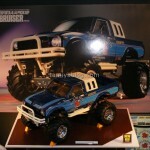 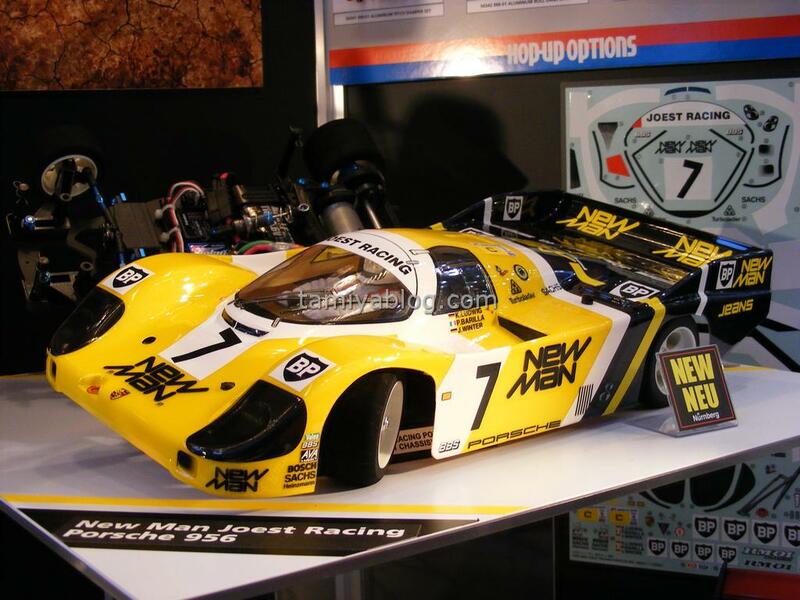 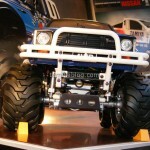 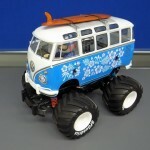 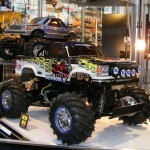 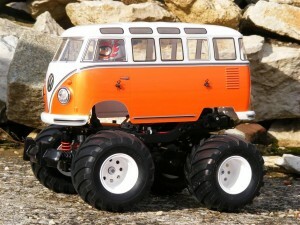 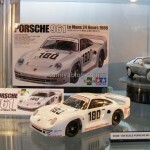 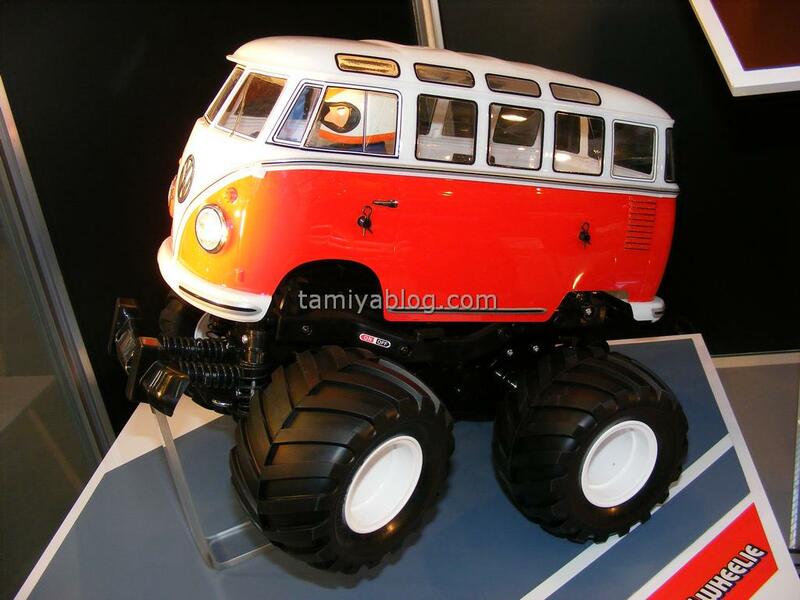 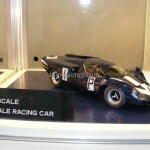 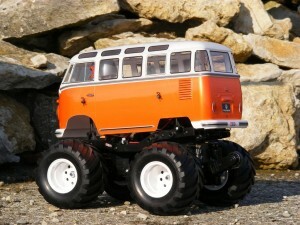 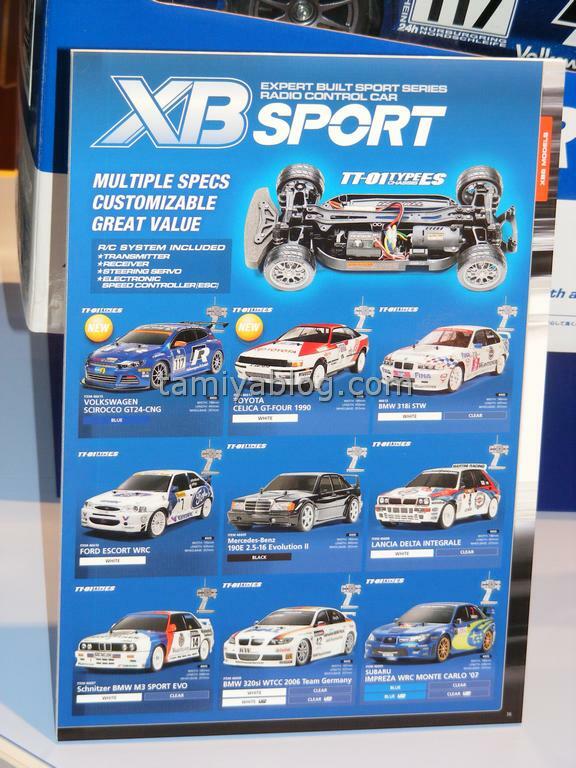 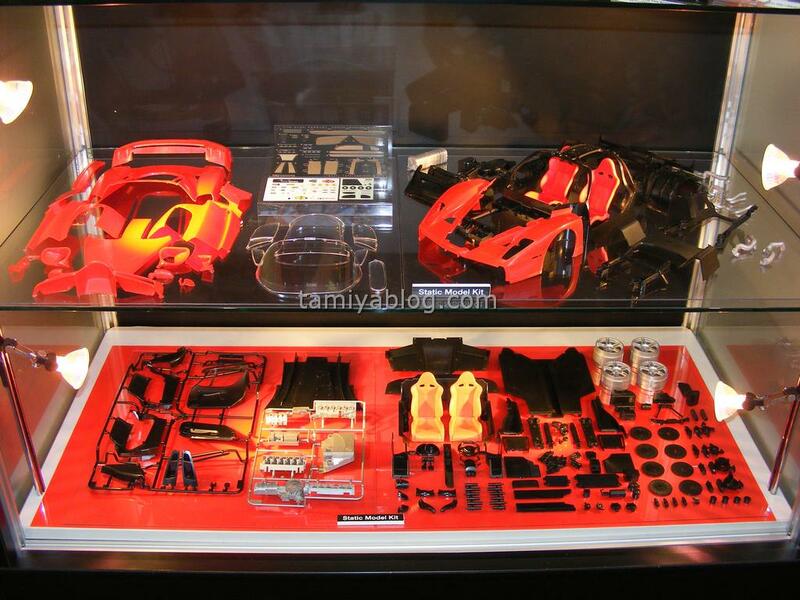 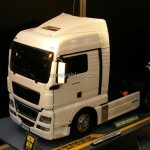 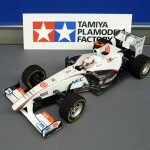 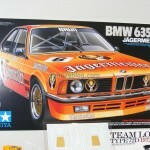 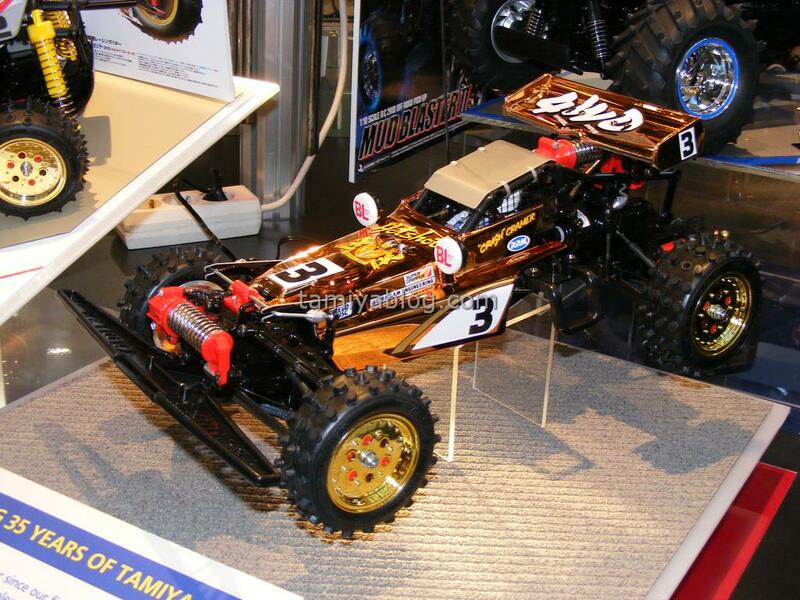 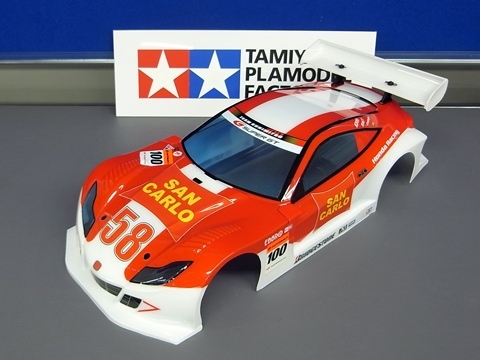 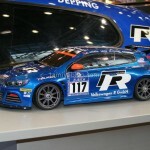 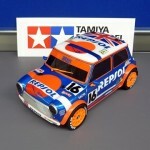 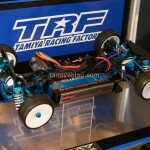 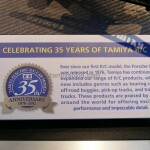 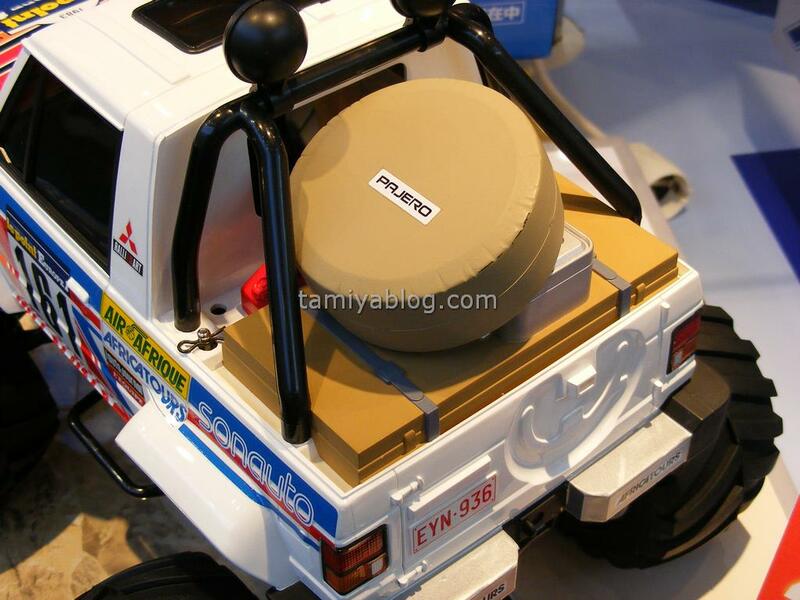 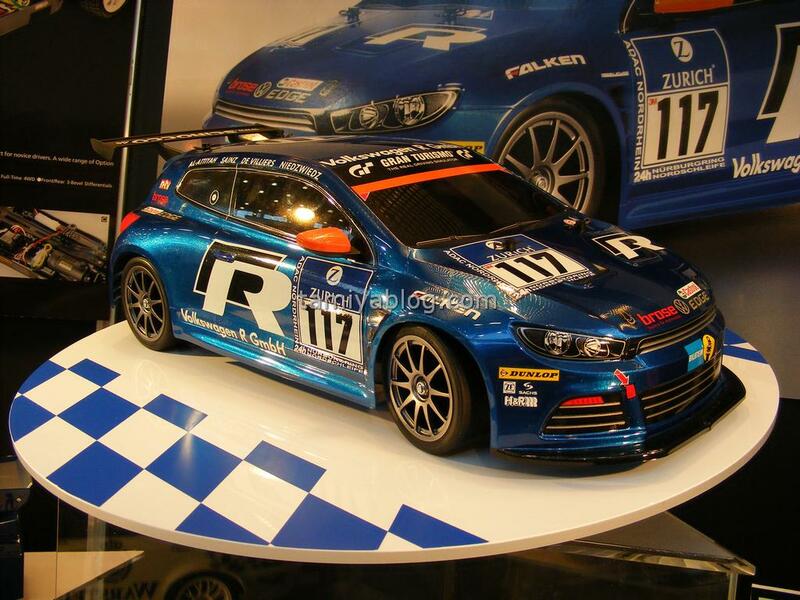 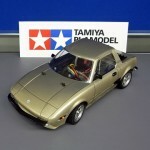 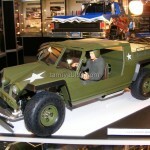 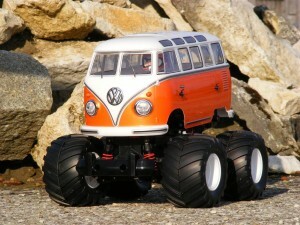 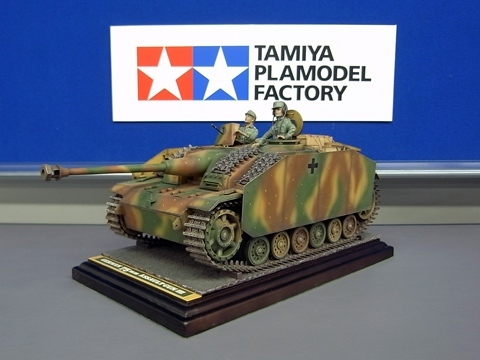 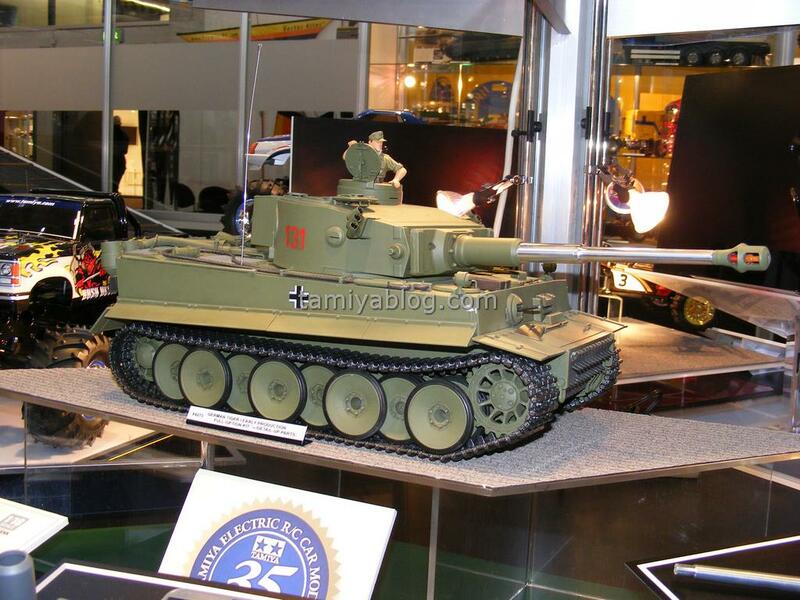 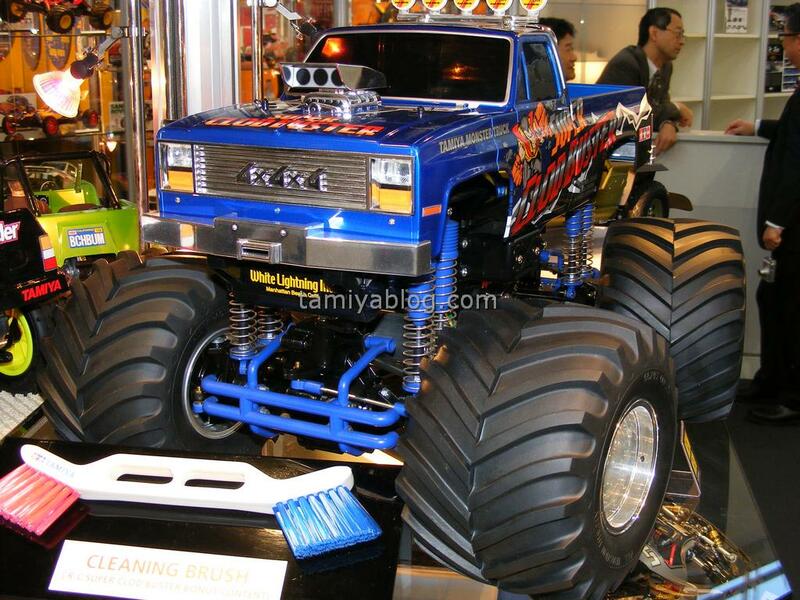 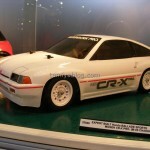 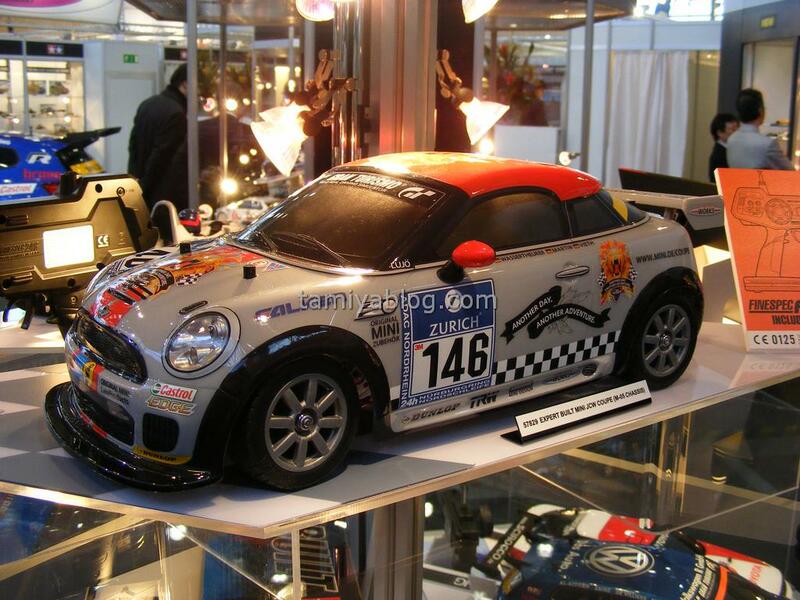 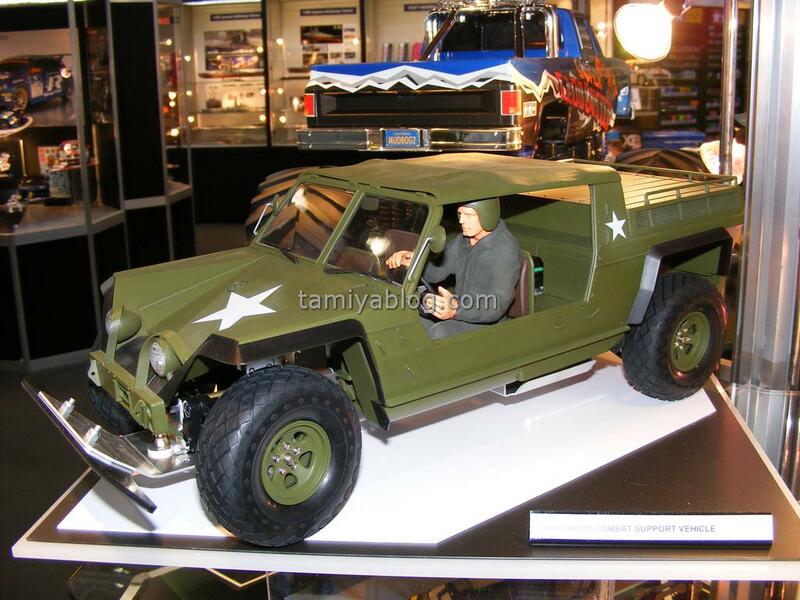 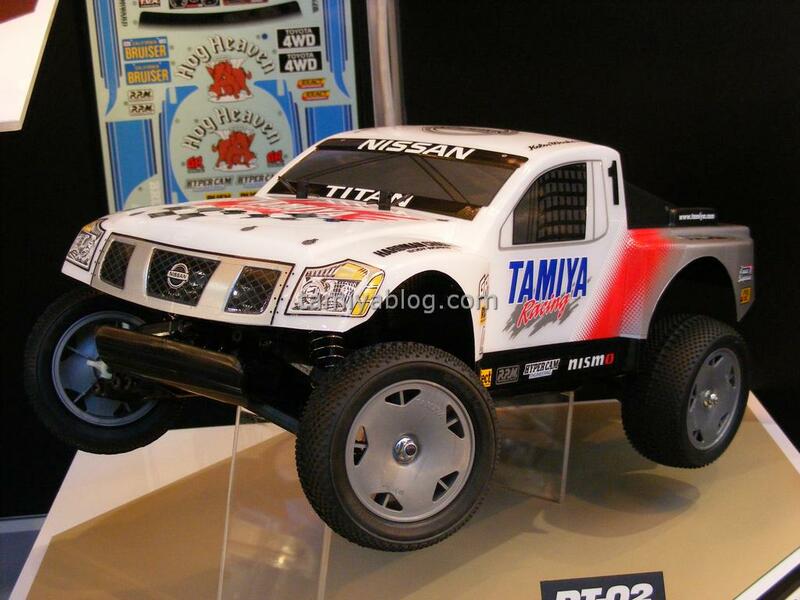 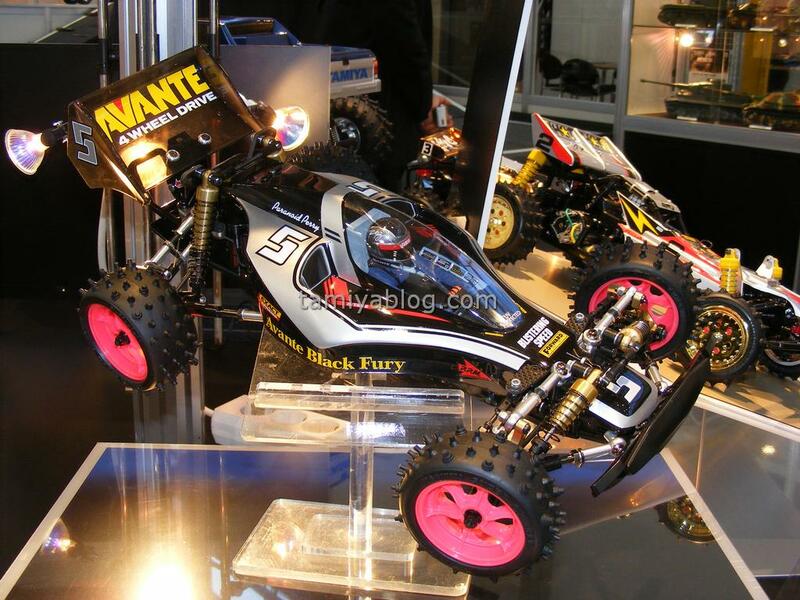 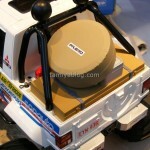 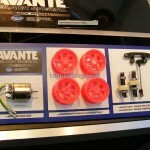 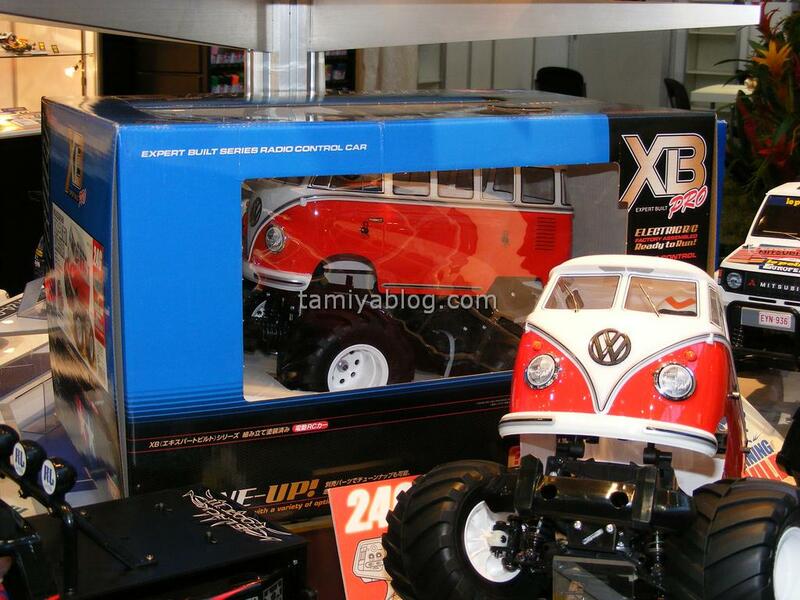 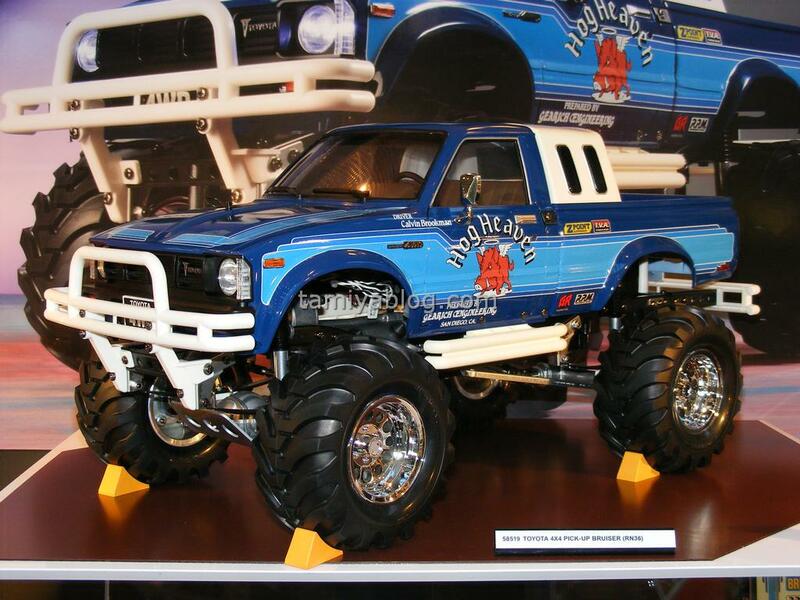 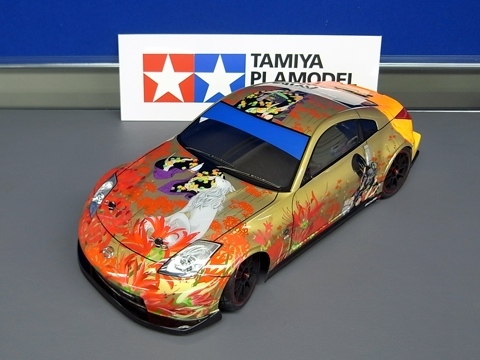 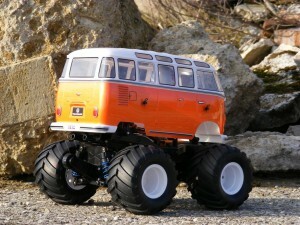 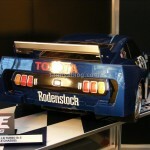 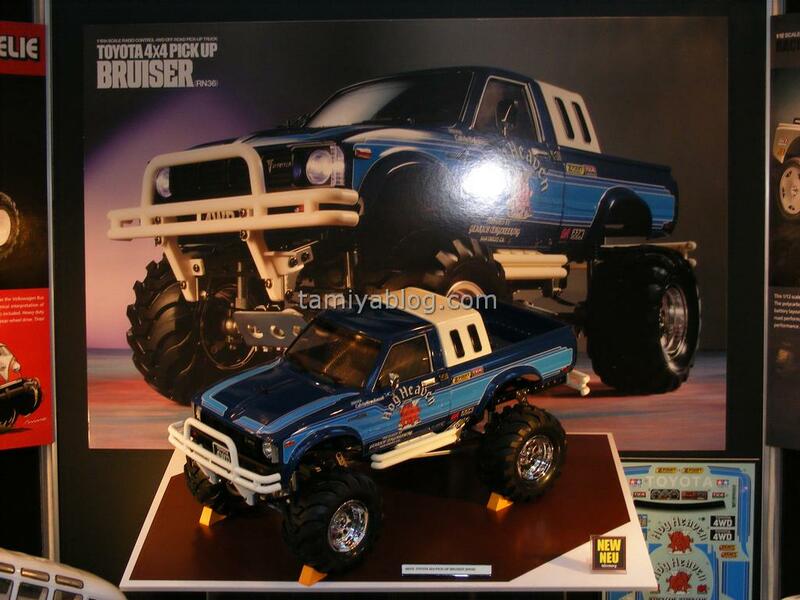 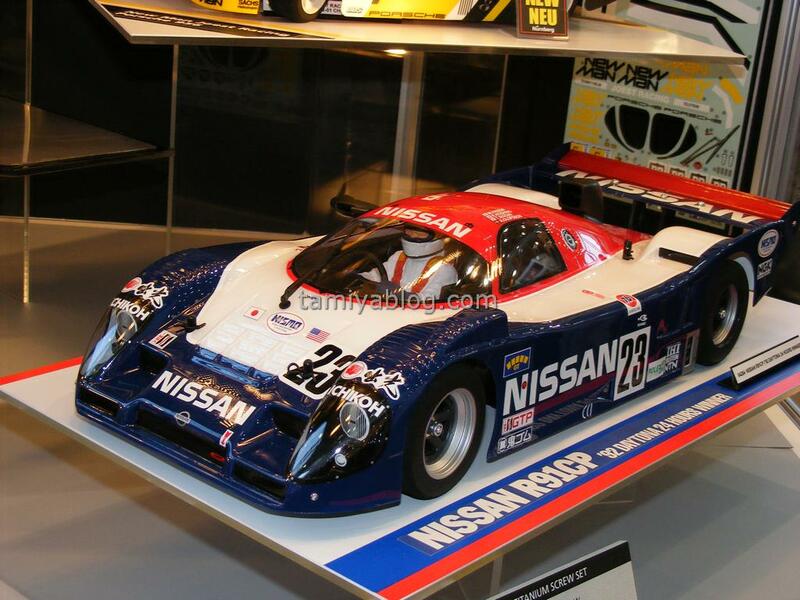 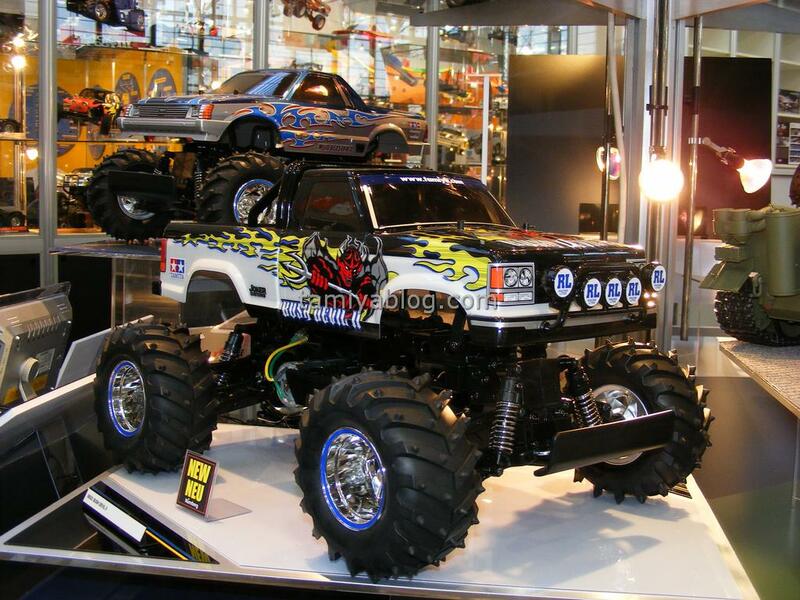 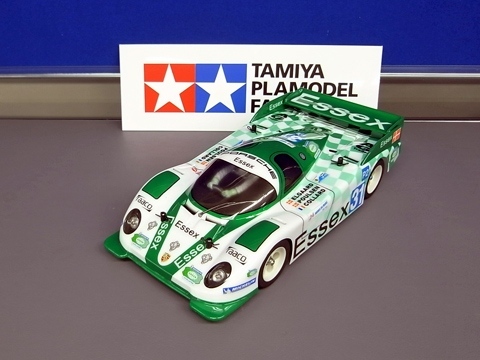 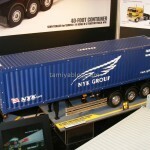 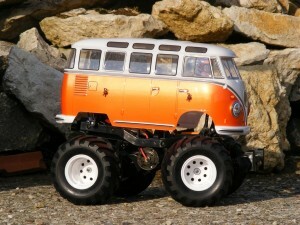 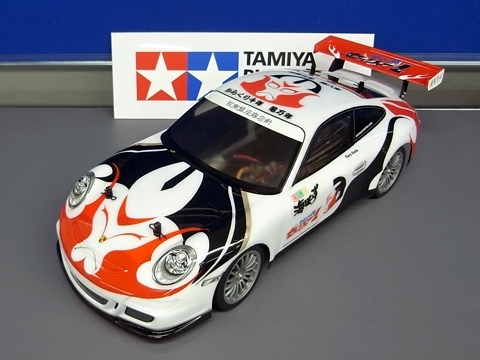 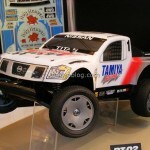 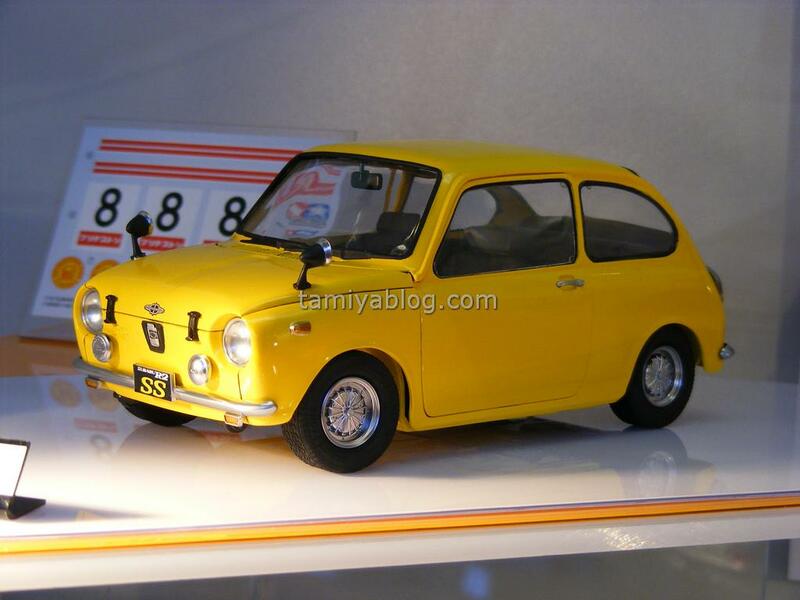 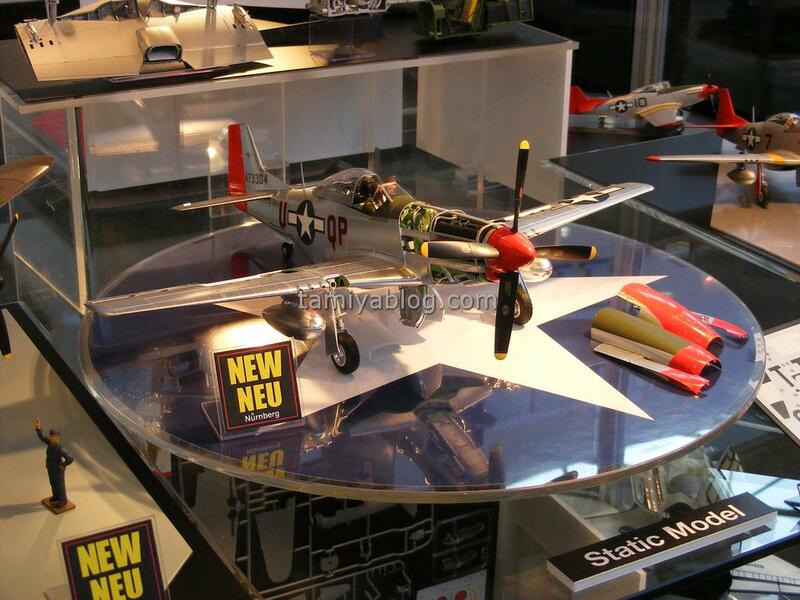 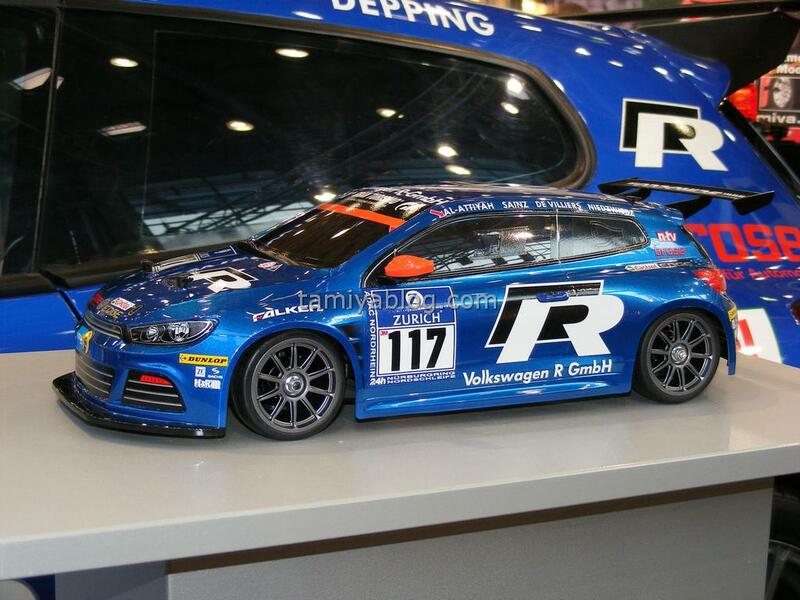 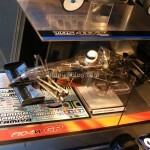 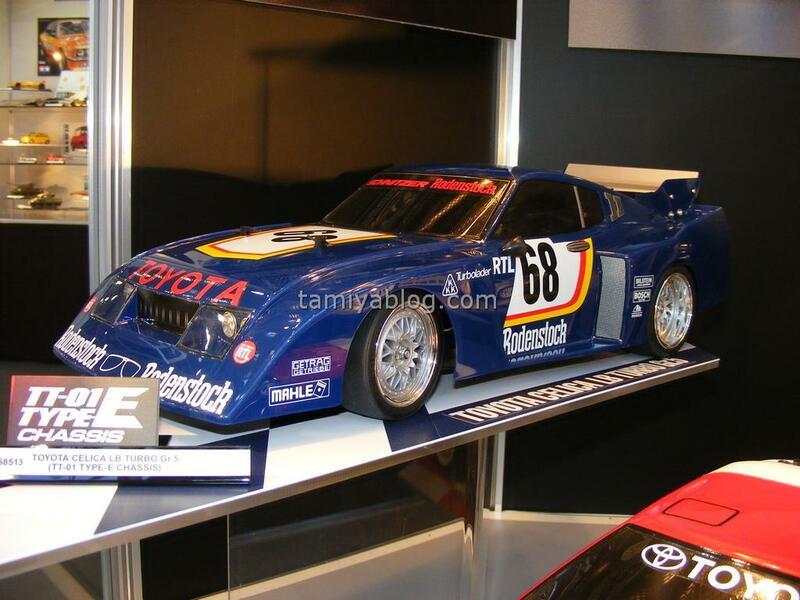 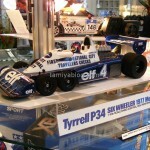 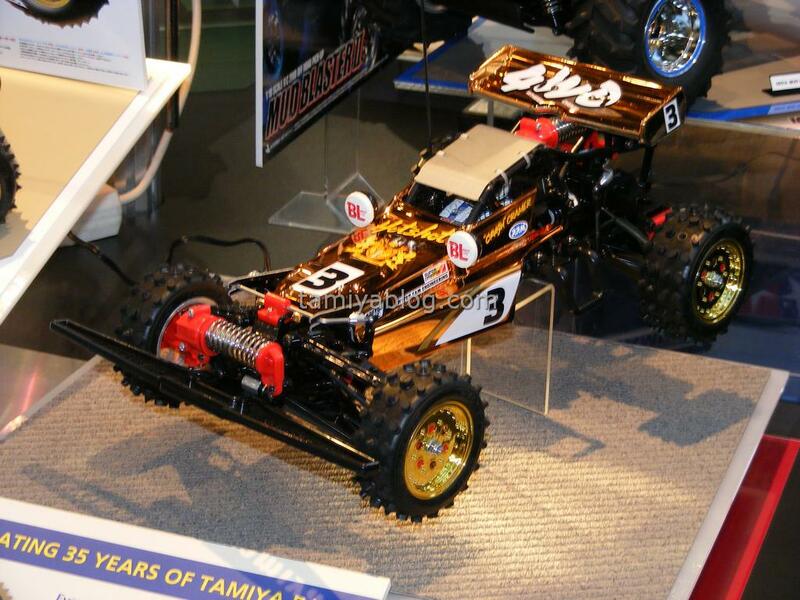 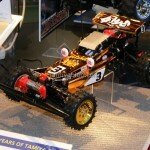 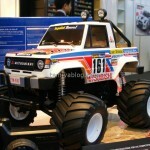 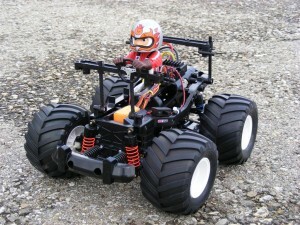 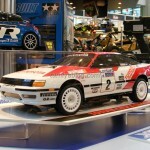 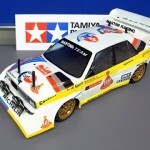 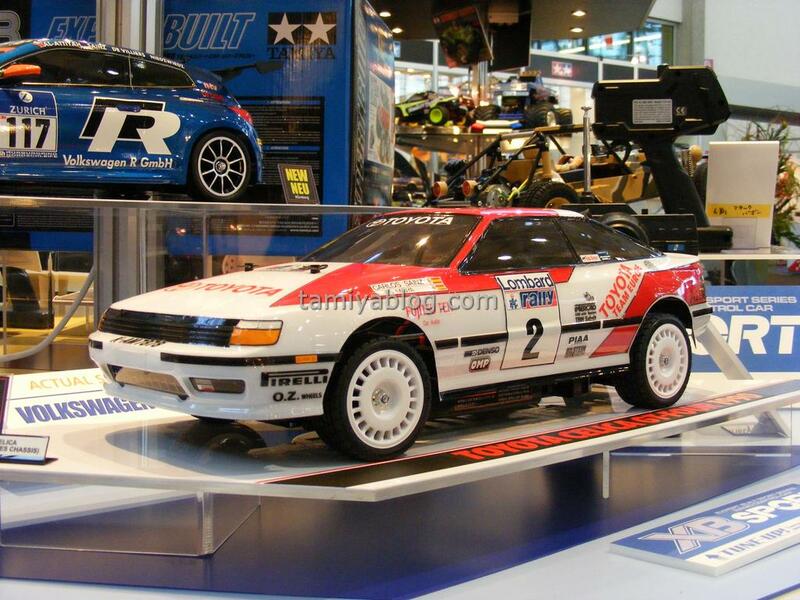 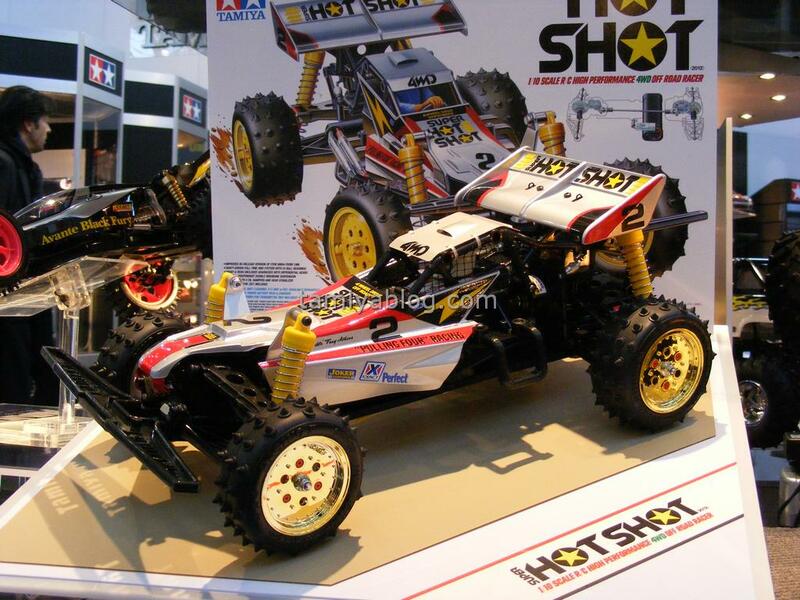 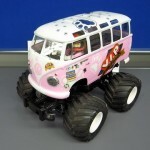 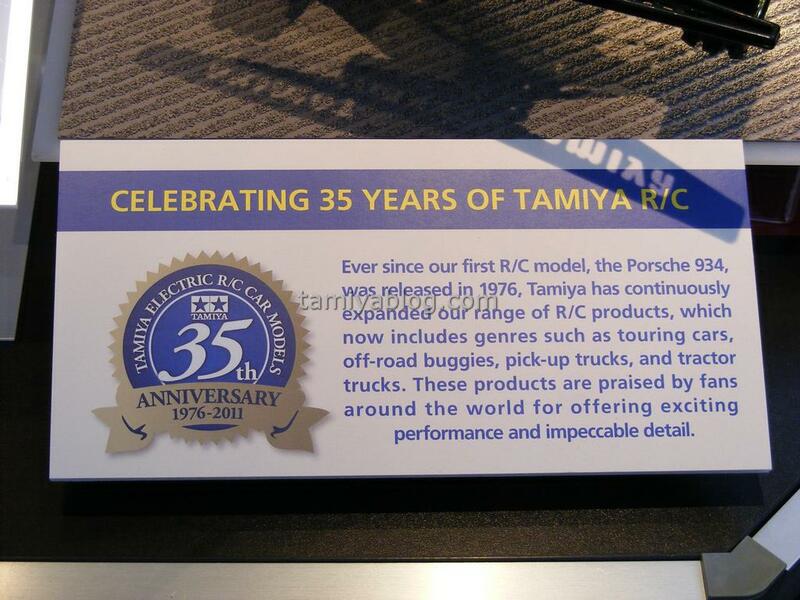 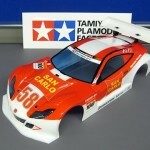 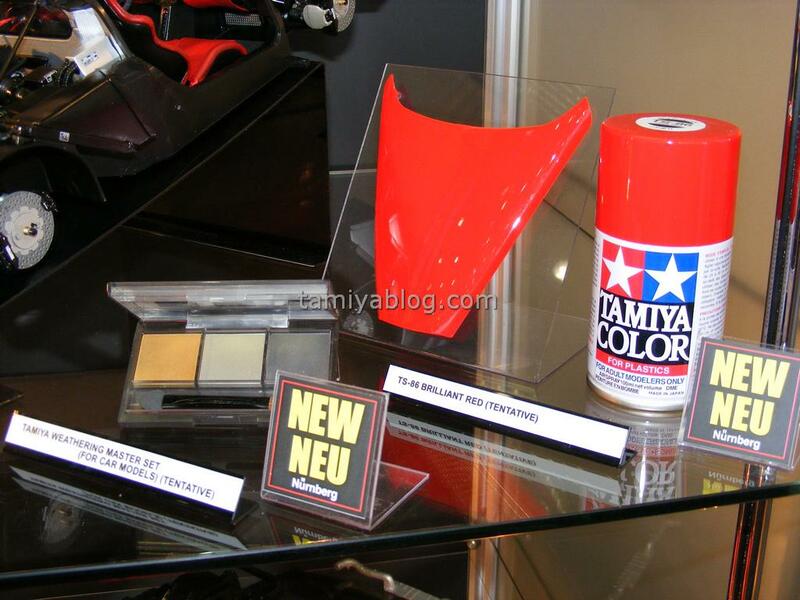 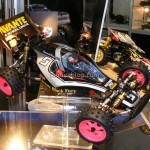 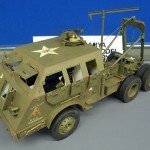 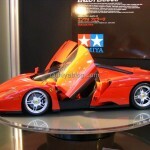 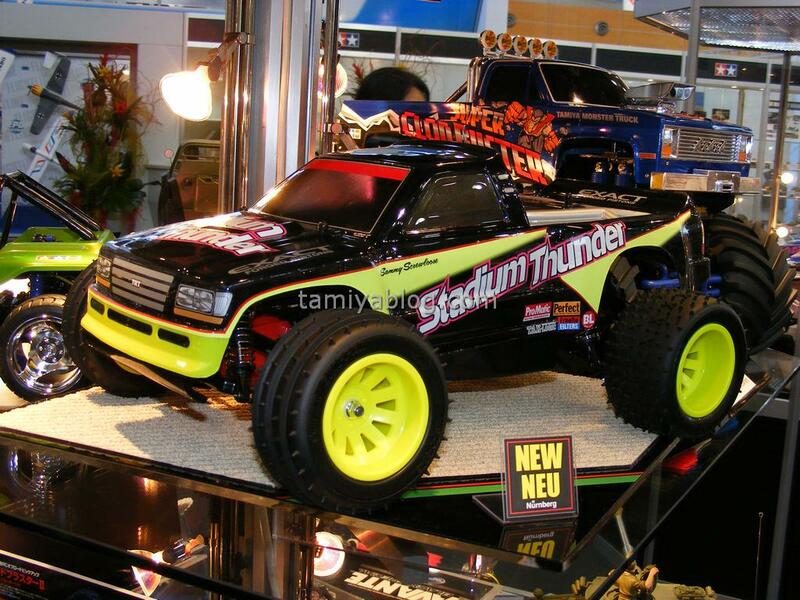 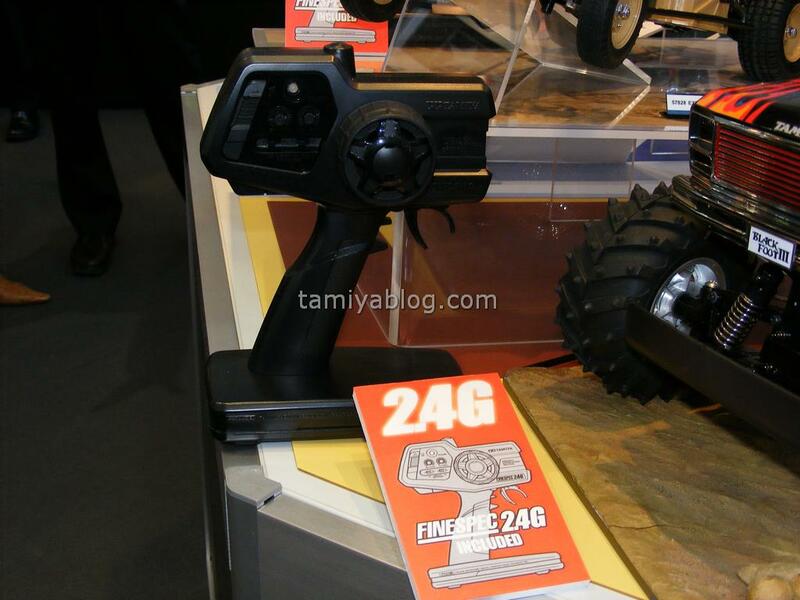 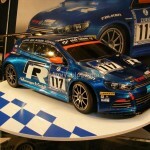 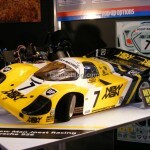 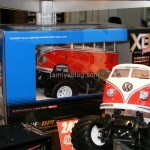 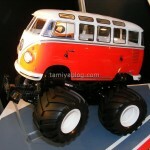 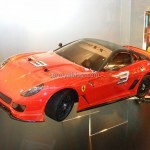 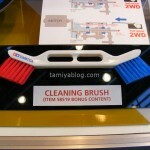 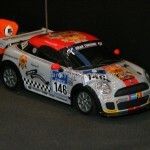 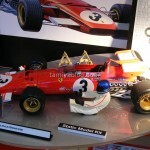 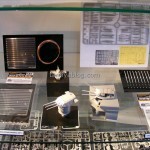 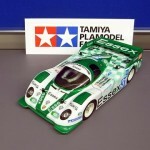 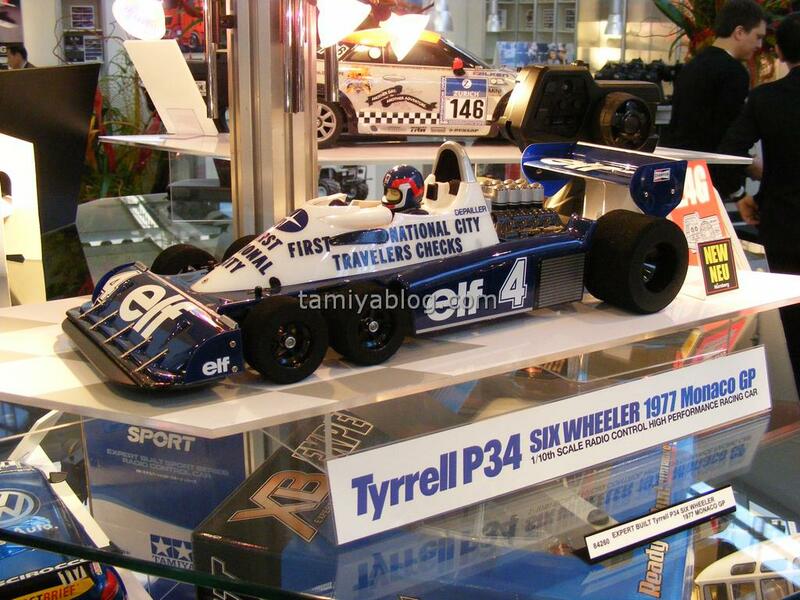 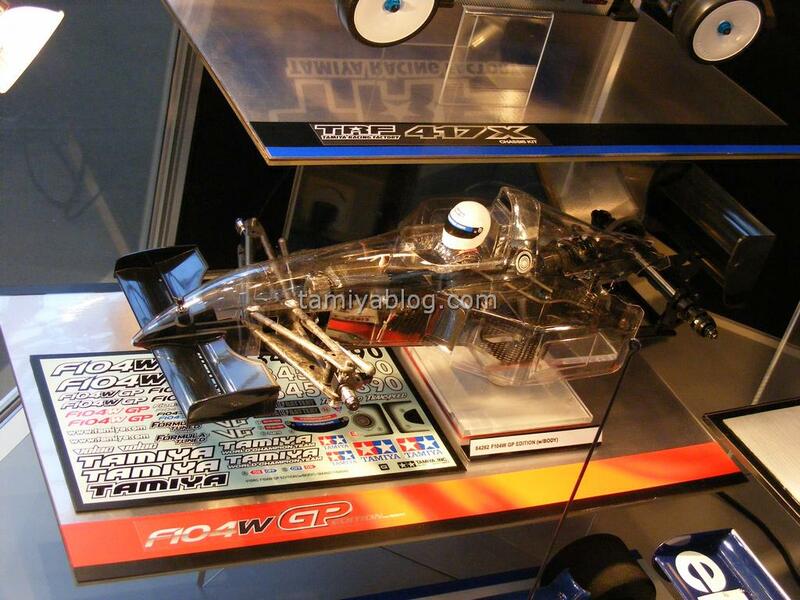 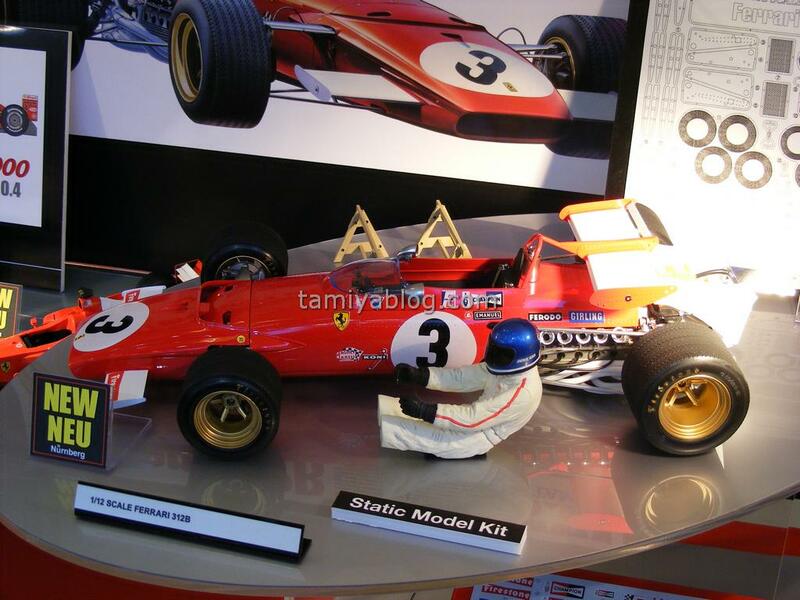 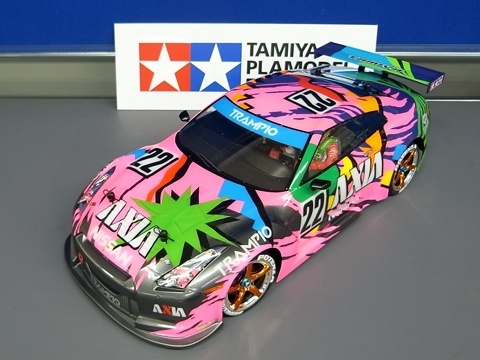 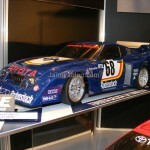 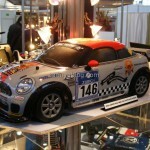 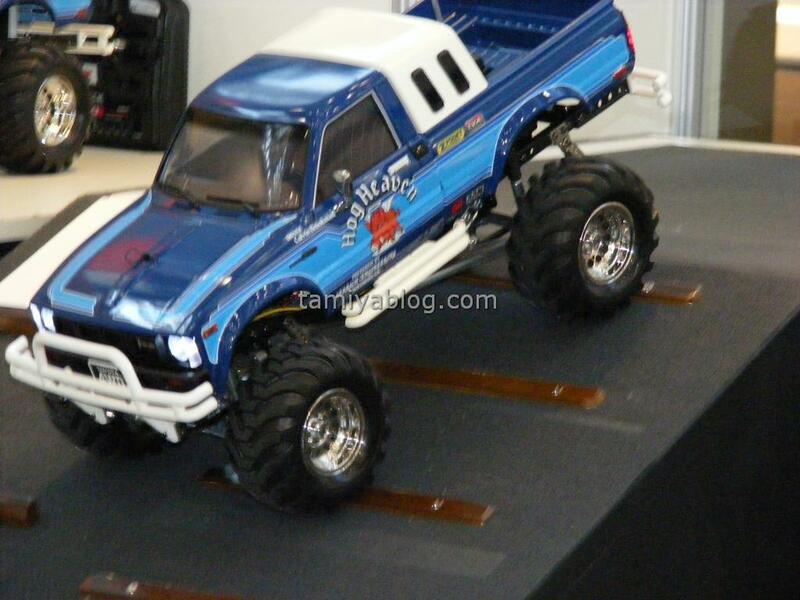 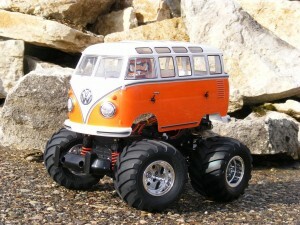 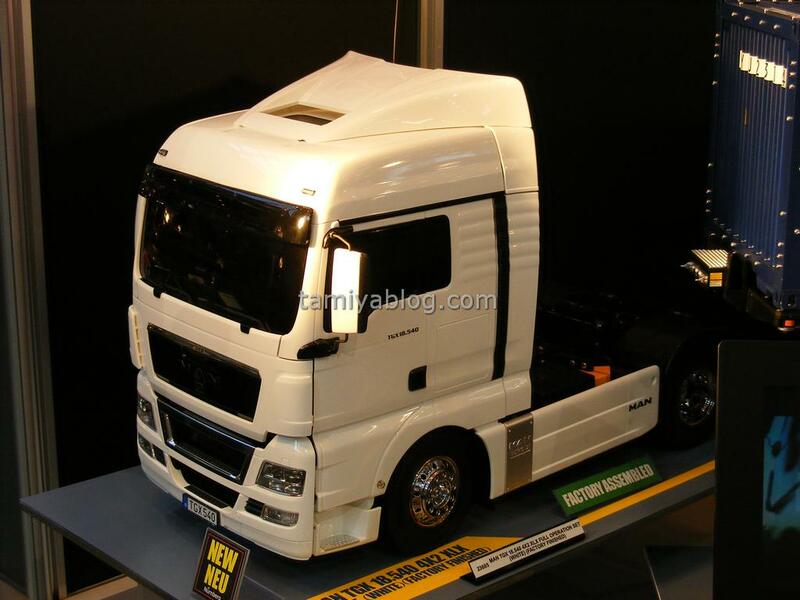 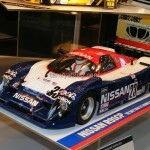 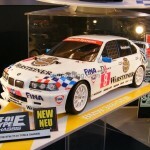 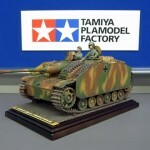 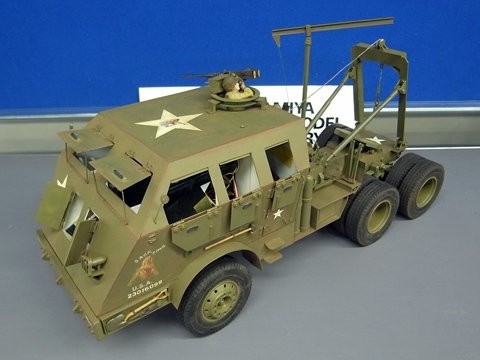 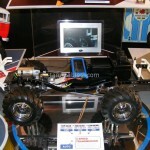 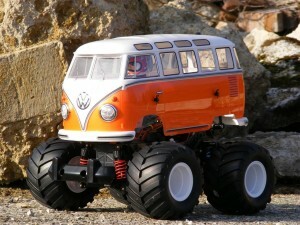 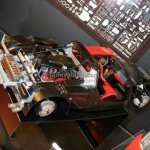 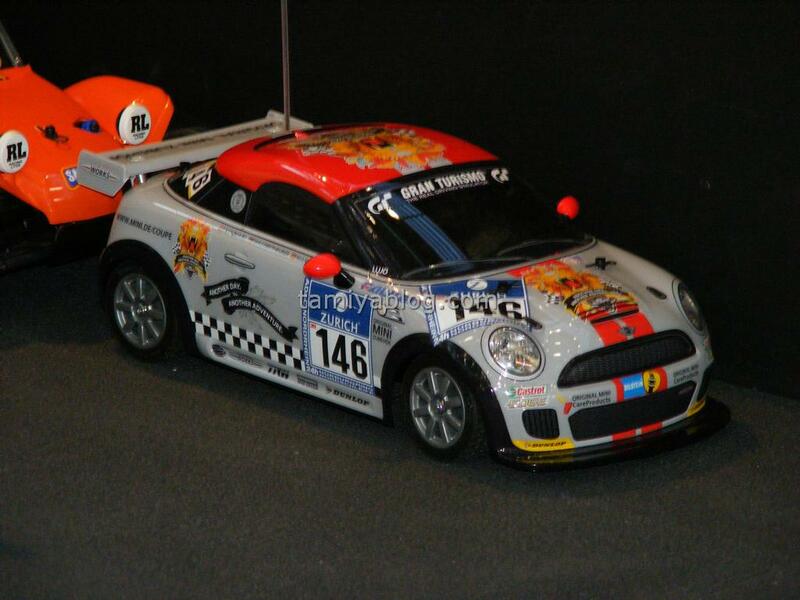 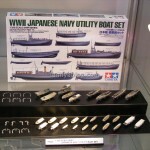 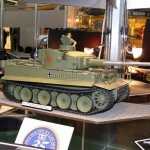 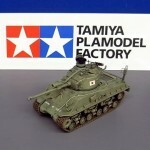 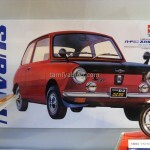 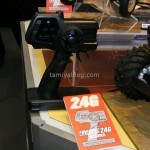 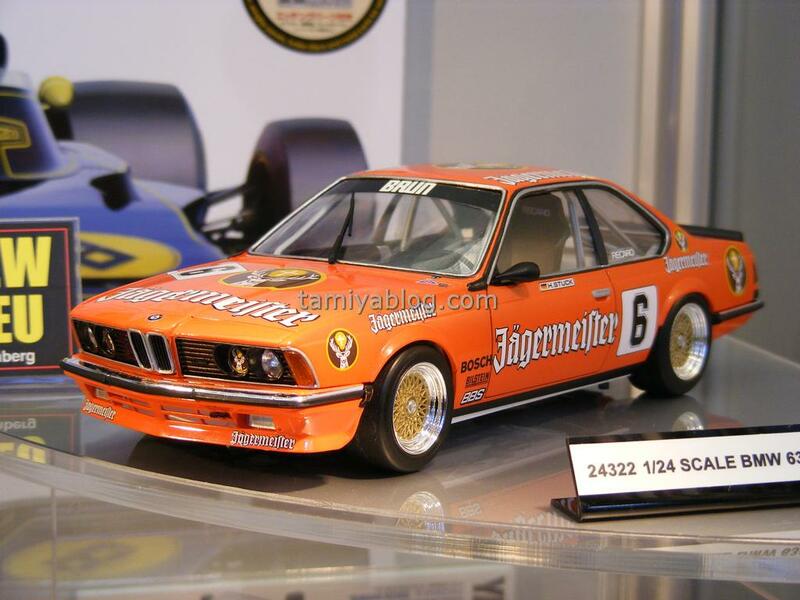 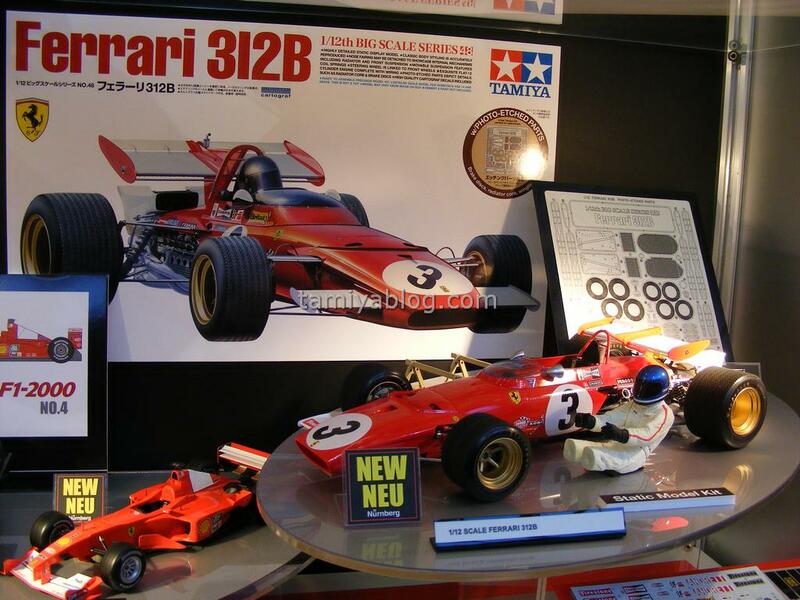 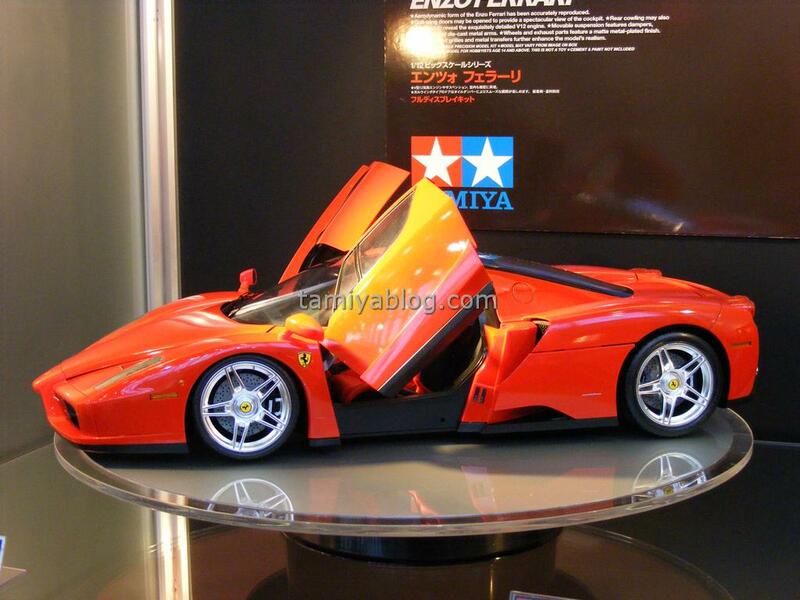 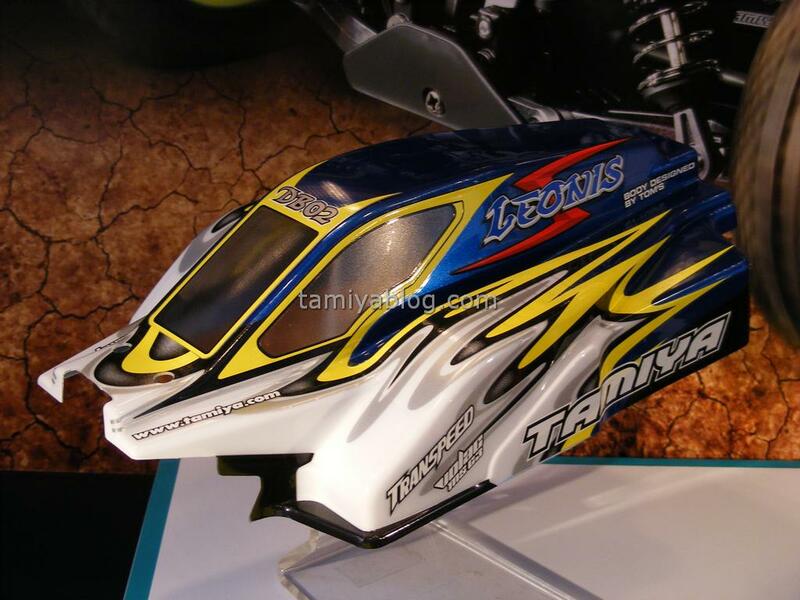 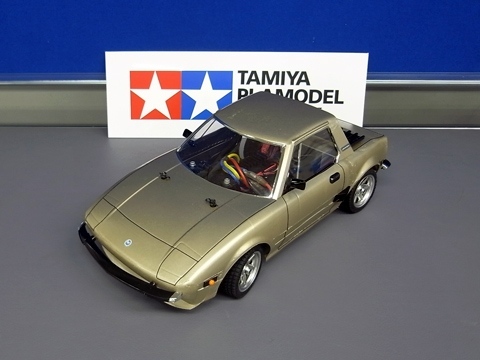 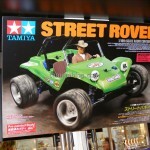 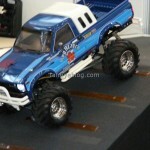 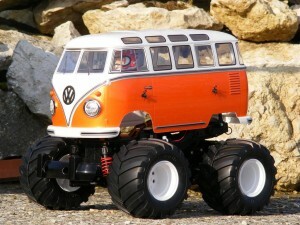 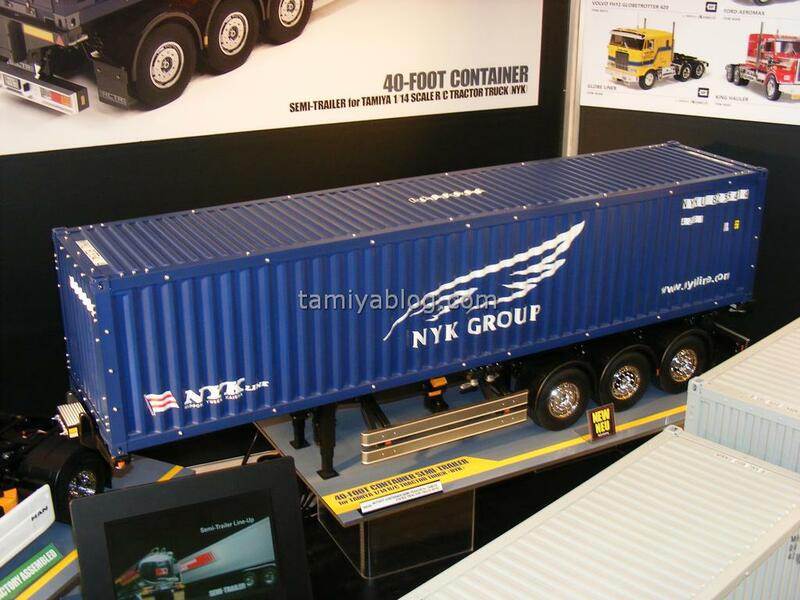 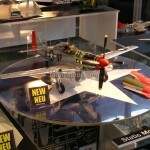 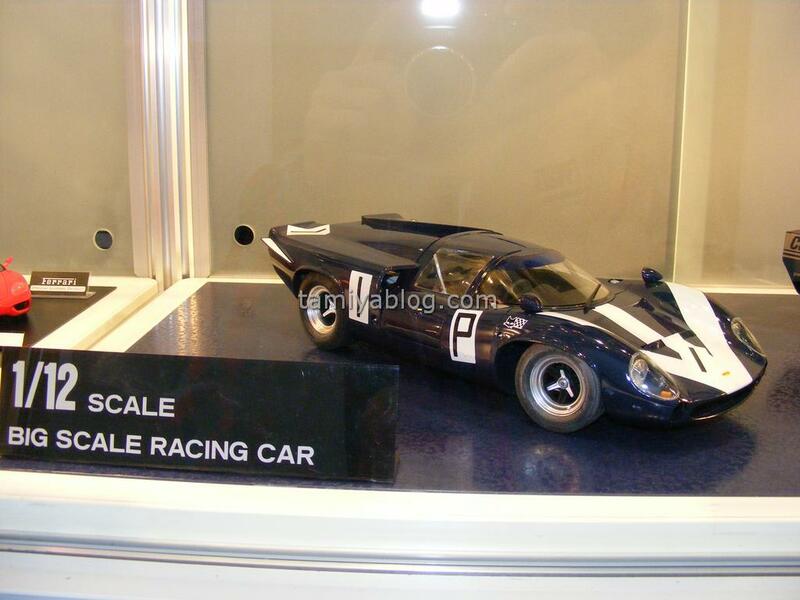 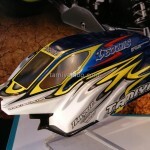 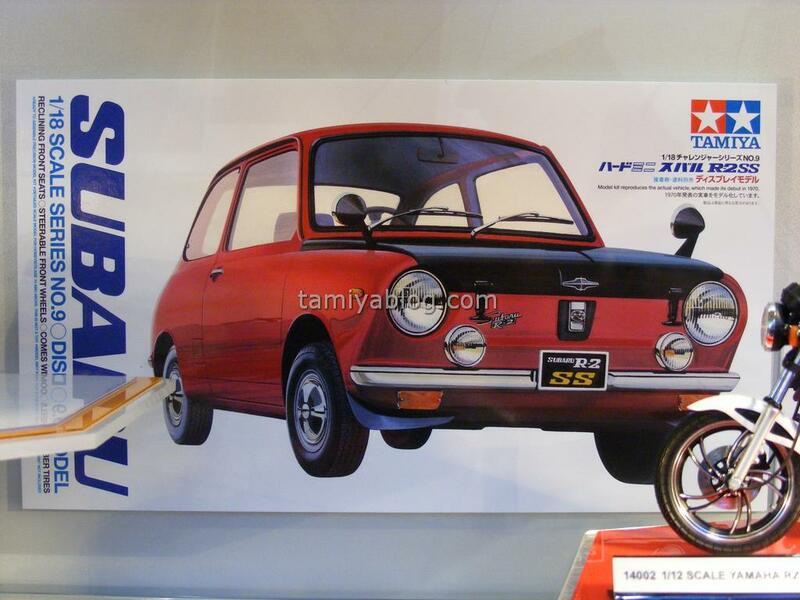 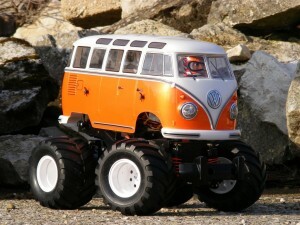 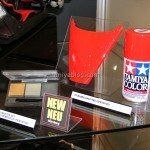 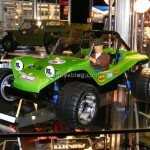 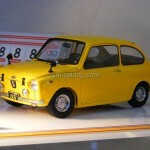 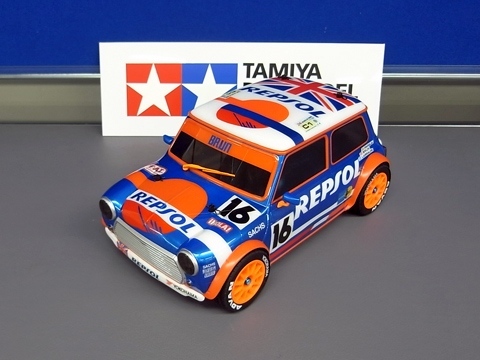 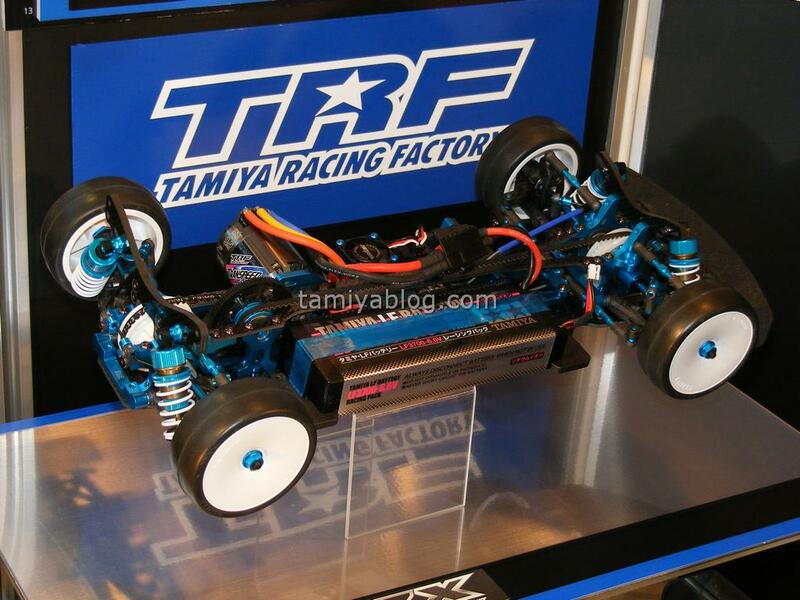 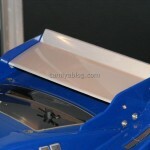 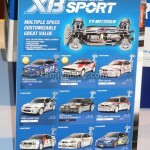 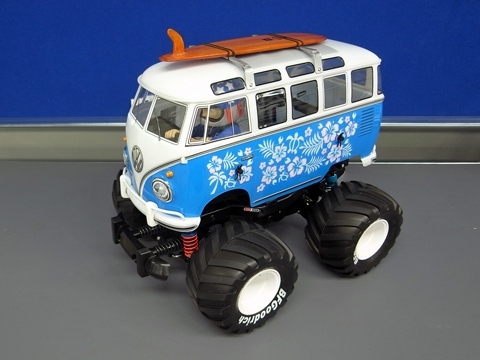 The team of tamiyablog.com had the chance to the see and drive the new Bruiser re-release at the Nuremberg Toy Fair 2012. 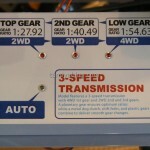 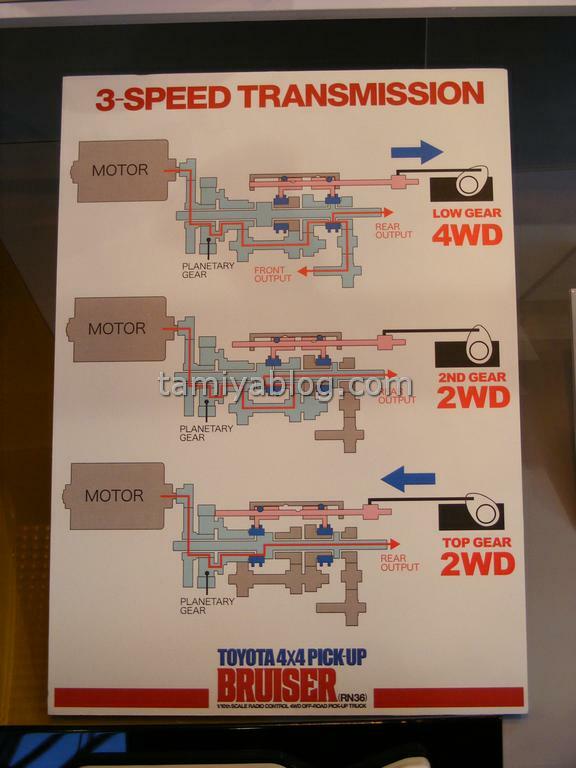 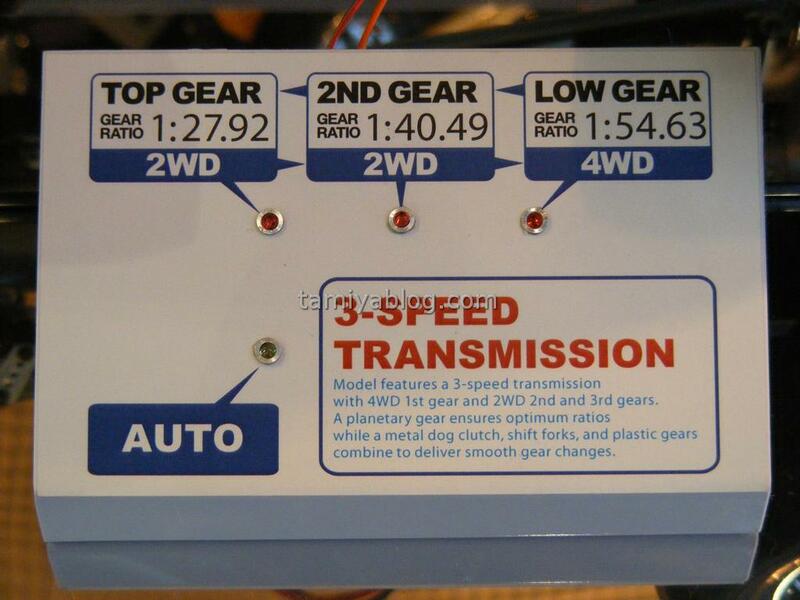 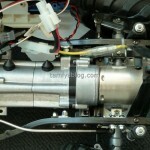 Our first observation was that the new gearbox drives similarly quiet as the old one and shifts gears very smoothly. 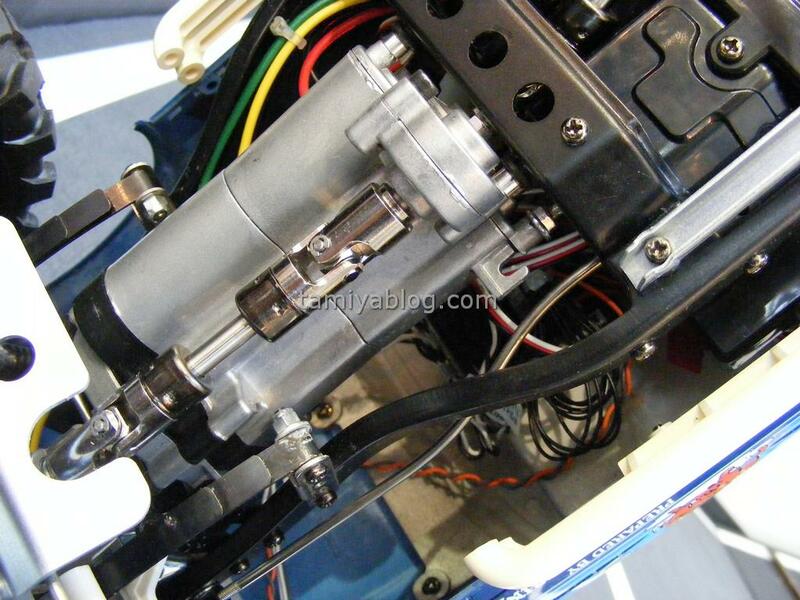 Also although not many changes have been made at the steering (at a first glance we only noticed new steering knuckles) it seems to respond better and turn quite sharper which is probably also because of the differentials. 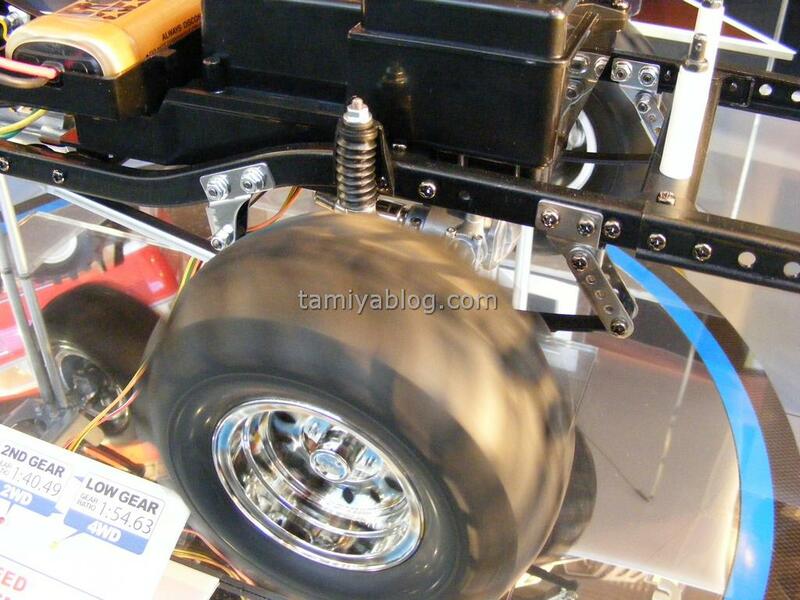 Another observation was that it doesn’t have front free drive wheel hubs any more (as they aren’t really needed with a diff) and so climbing in reverse is significantly improved. 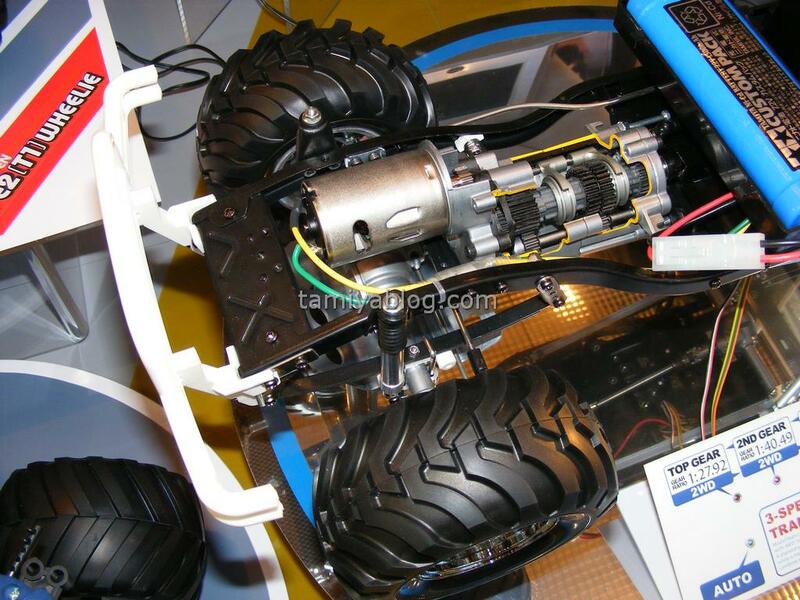 The tires of the 2 running prototypes seemed also a bit softer then the old ones and the tires of the demonstration chassis were significantly softer. 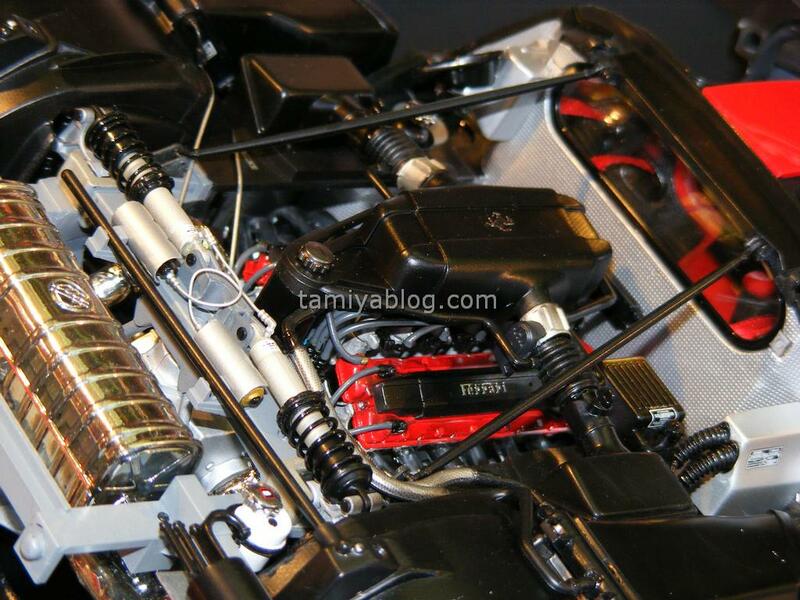 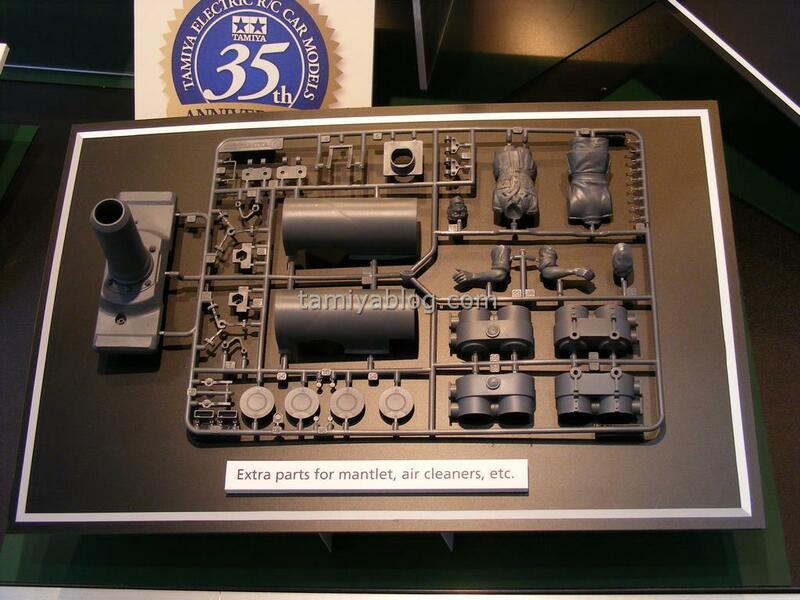 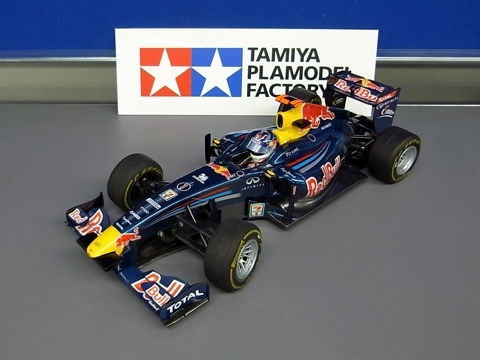 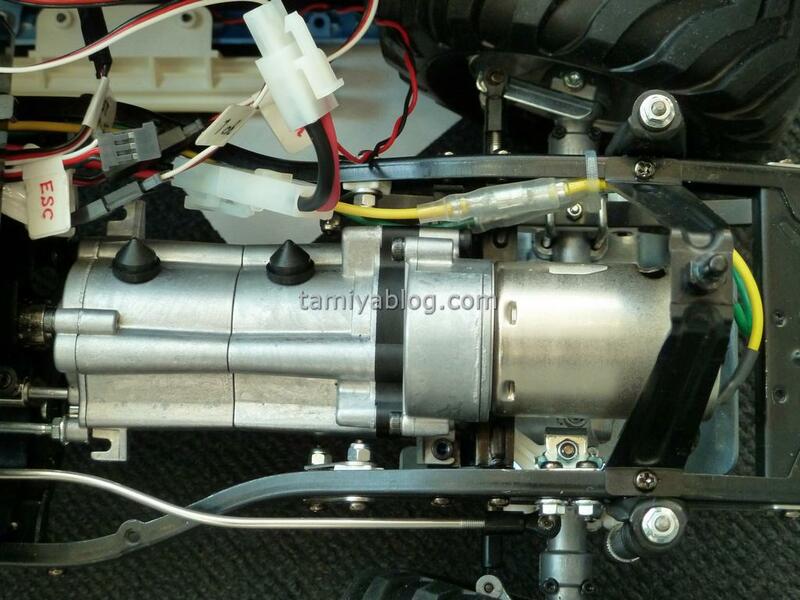 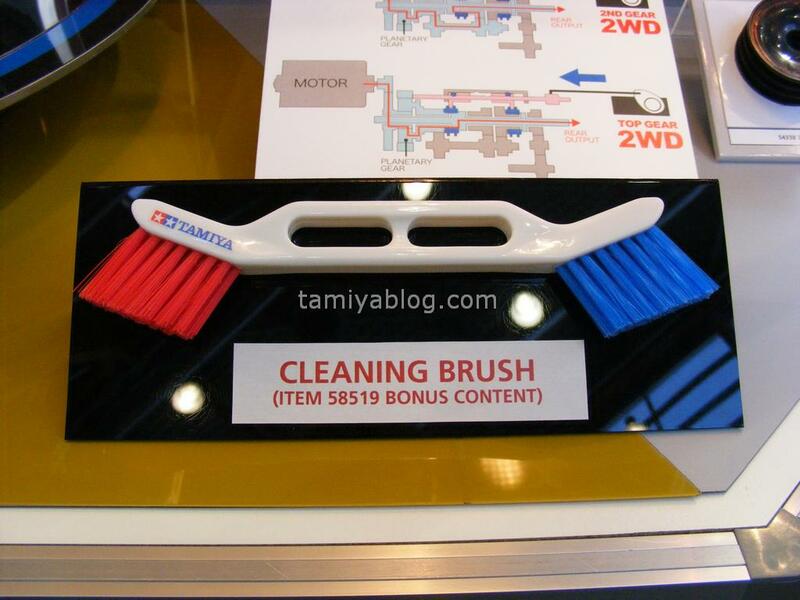 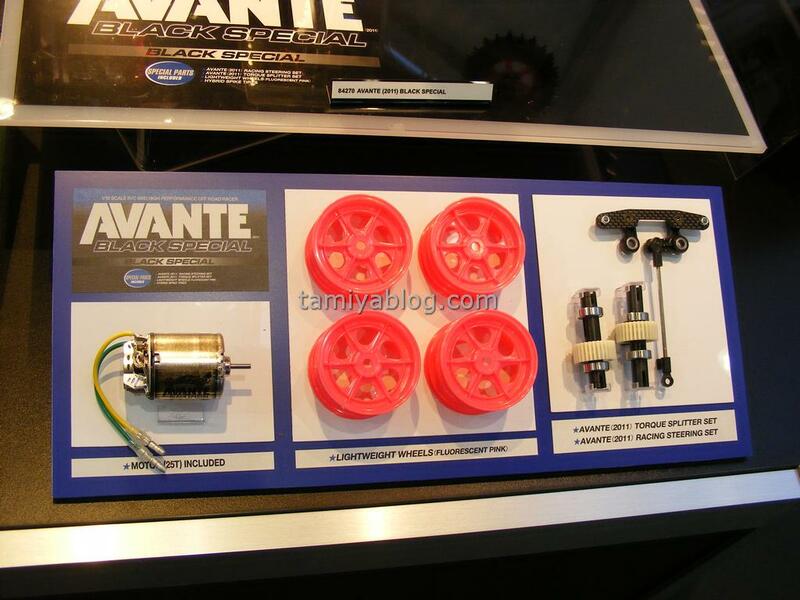 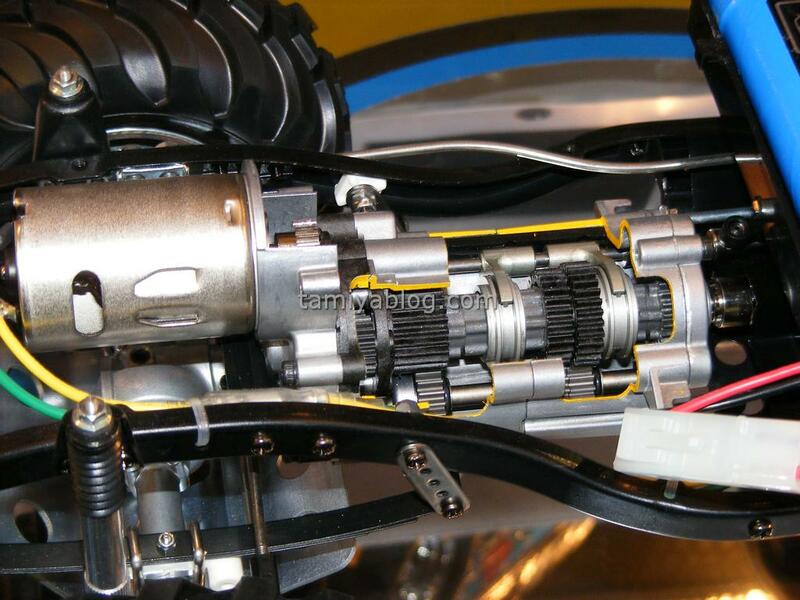 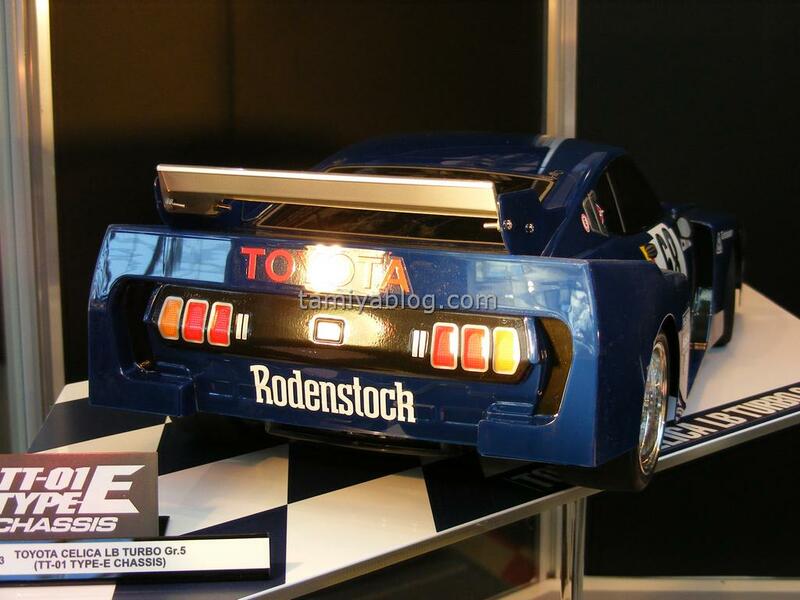 The new gearbox is shorter and elastically mount only in the rear (front mount is stiff) and it has 2 lugs which aren’t used, so maybe Tamiya has more future plans for it? 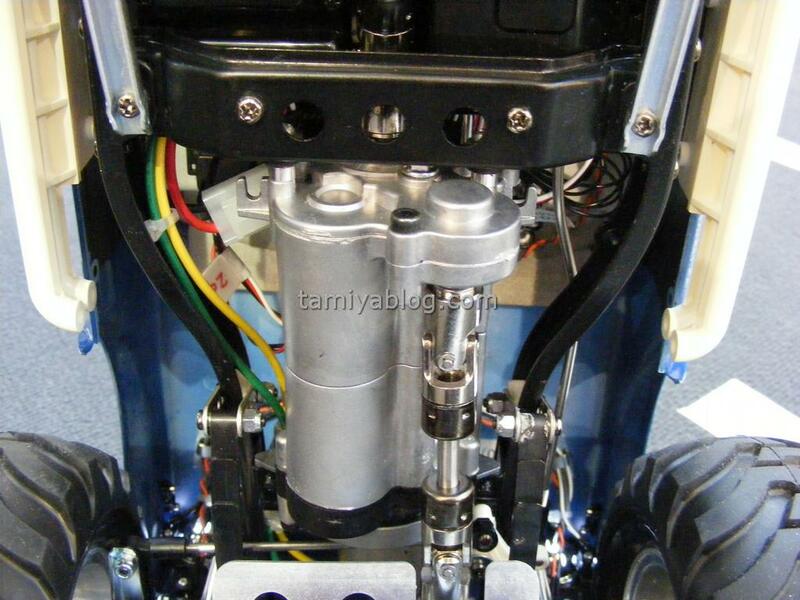 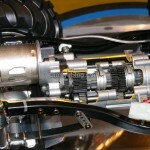 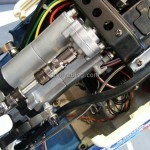 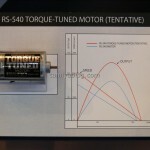 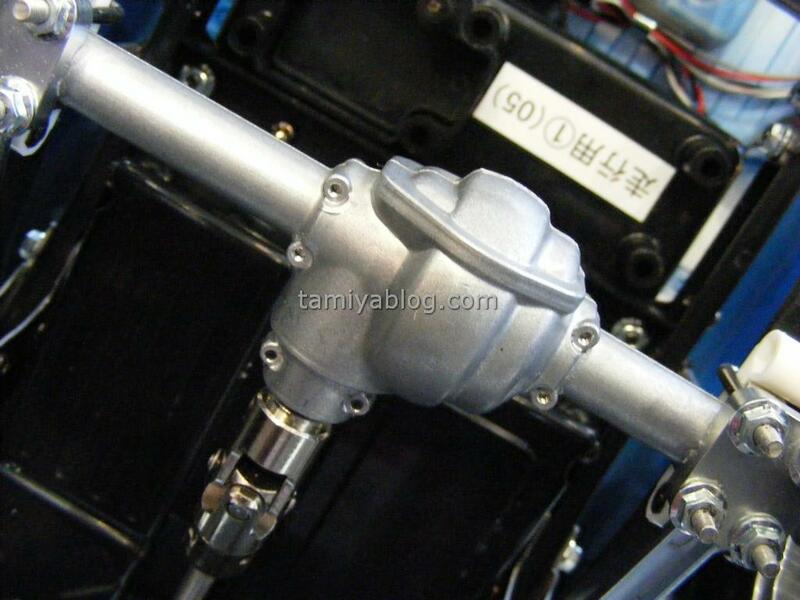 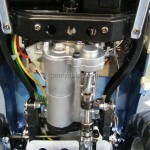 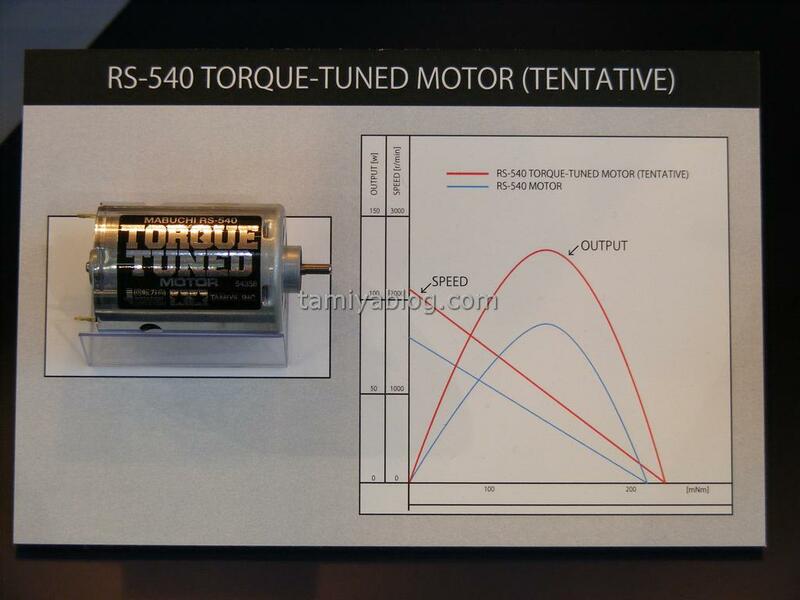 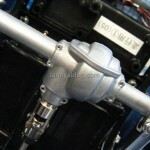 Also in the end there is a rod which at first glance has no function but possibly is for easier servo rod alignment. 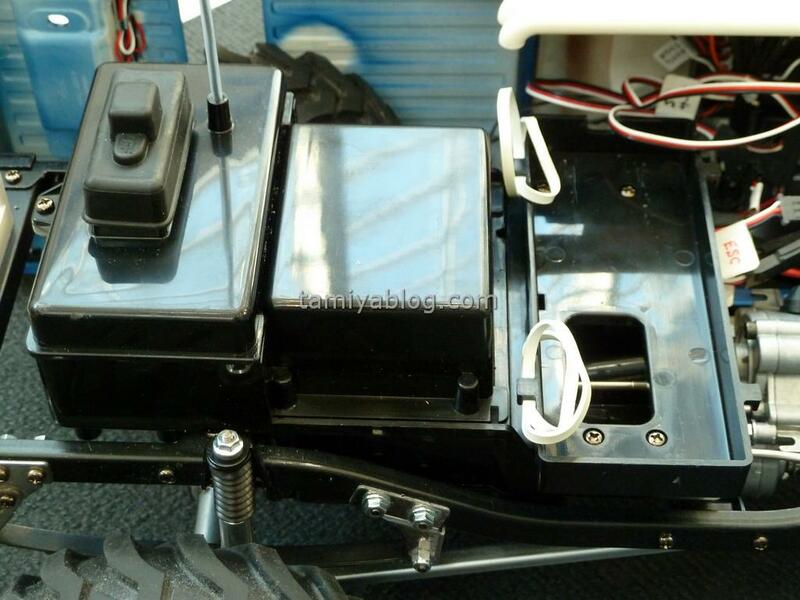 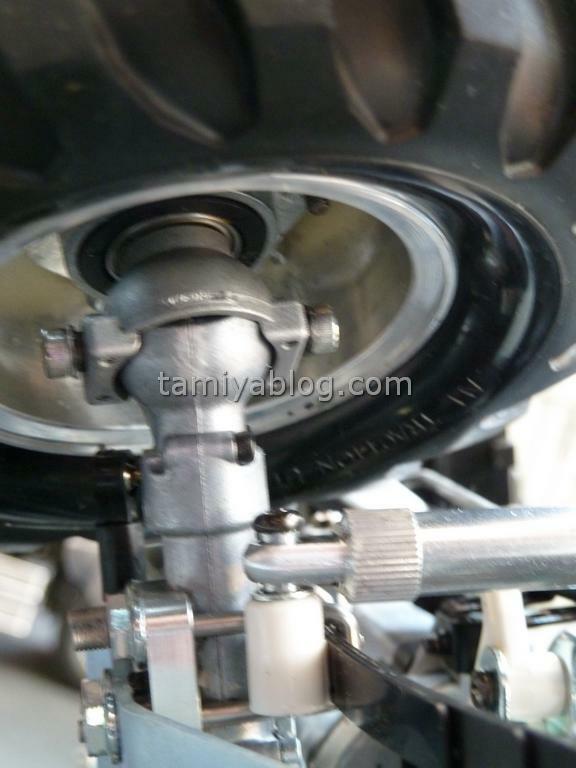 The differentials have a screw and thread on the upper side which is probably for locking them. 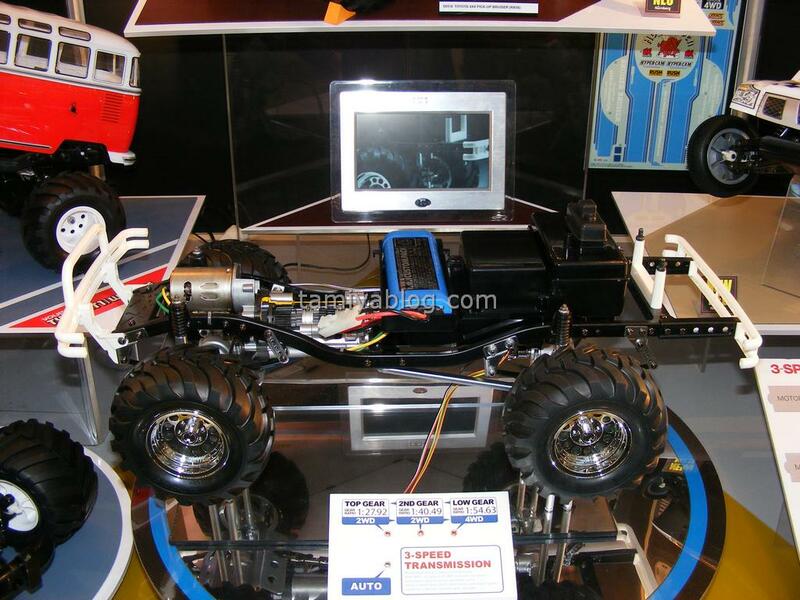 From what we understood from a Japanese employee the box won’t have blisters and that there won’t be a Multi Function Controller for it, the runners in the fair had just both TLU-01 and TLU-02 light units. 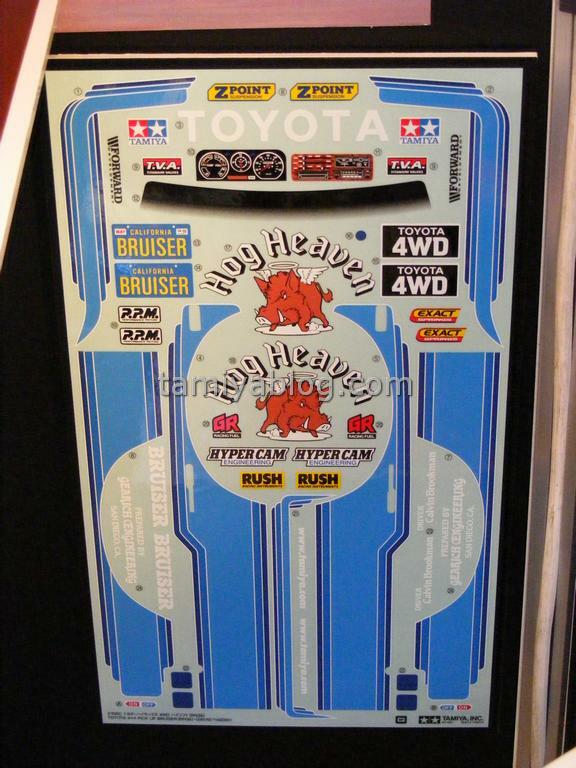 The decal sheet has 4 blue squares to possibly cover the side bar screws, weird it didn’t have 6 or 8 for all the screws. 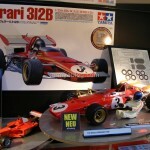 All in all we were extremely satisfied by this unexpected re-release and the amount of important but well hidden improvements. 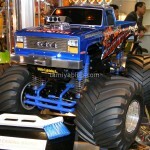 More photos of the fair can be seen here. 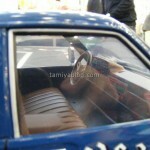 This entry was posted in Event Report, Future Releases, Media, Reviews, Vintage on February 3, 2012 by admin. 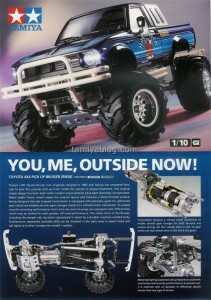 This entry was posted in Future Releases, Media on February 3, 2012 by admin. 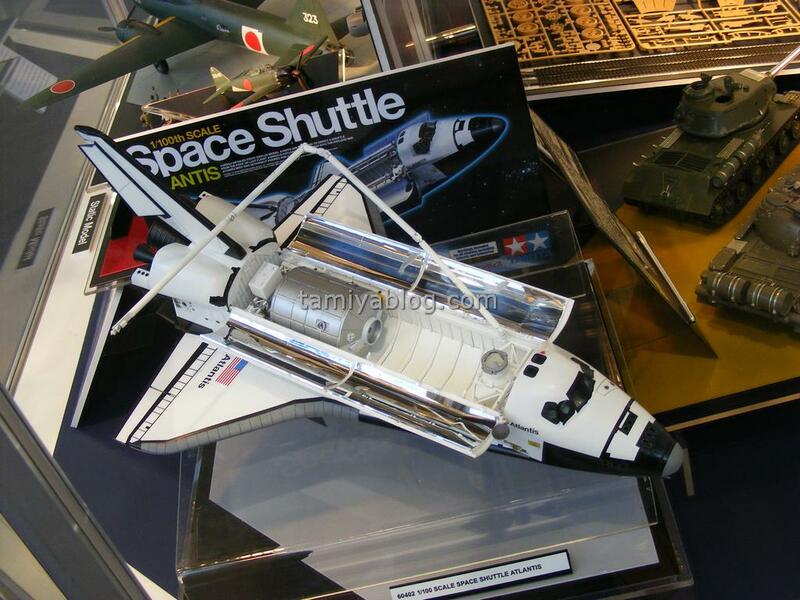 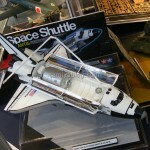 This entry was posted in Event Report, Future Releases, Vintage on February 1, 2012 by admin.